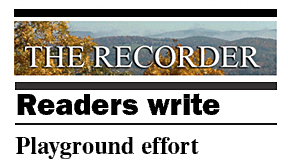 You will need to click on the link to read the FULL ARTICLES, or the image to see a larger view. 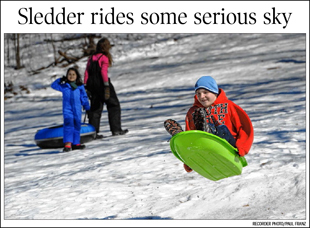 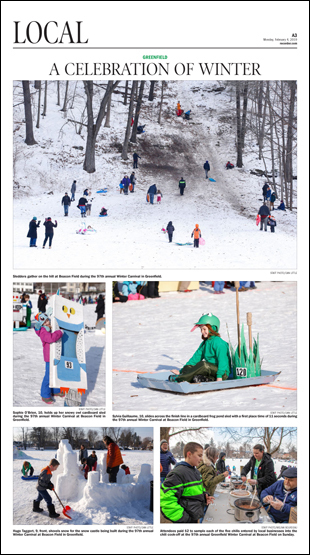 • Sledders gather on the hill at Beacon Field during the 97th annual Winter Carnival in Greenfield. 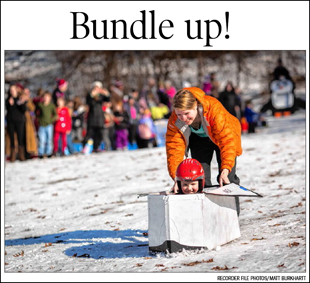 • Sophie O’Brien,10, holds up her snowy owl cardboard sled during the 97th annual Winter Carnival at Beacon Field in Greenfield. 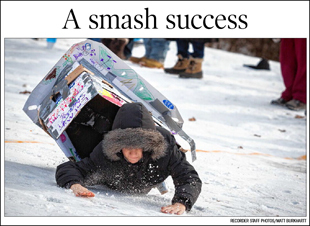 • Sylvia Guillaume, 10, slides across the finish line in a cardboard frog pond sled with a first place time of 11 seconds. 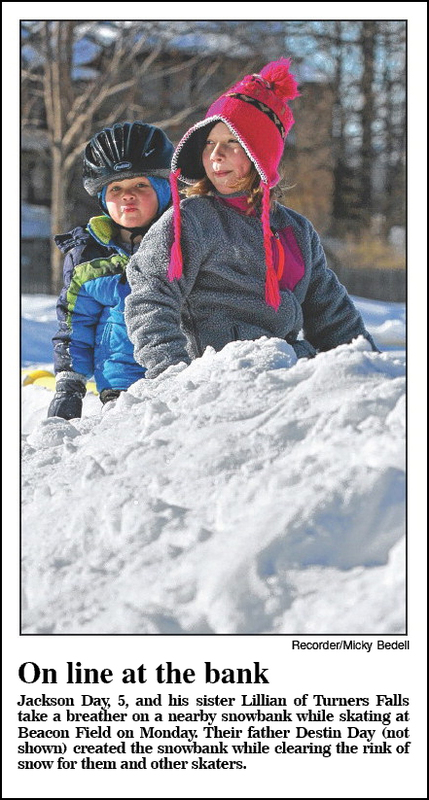 • Hugo Taggert, 9, front, shovels snow for the snow castle being built during the 97th annual Winter Carnival at Beacon Field in Greenfield. 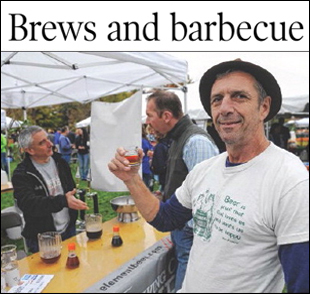 • Attendees paid $2 to sample each of the five chilis entered by local businesses in to the chili cook-off on Sunday. 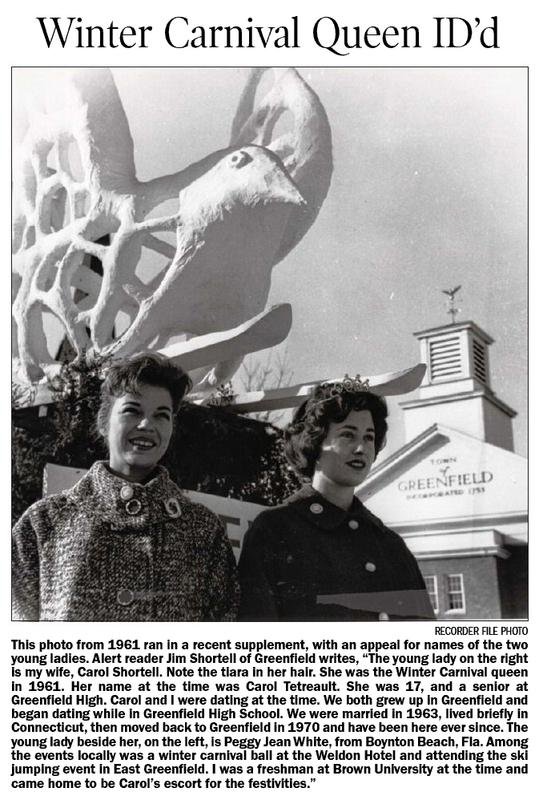 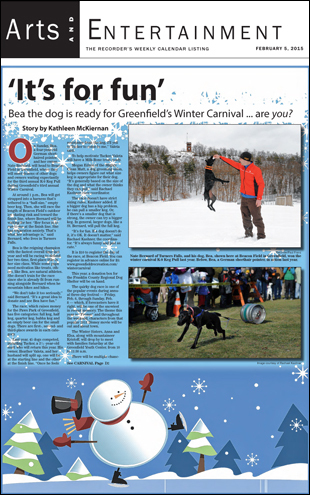 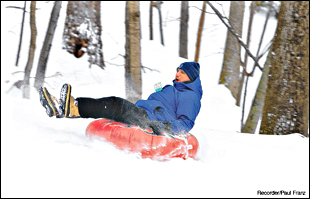 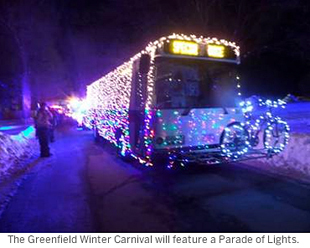 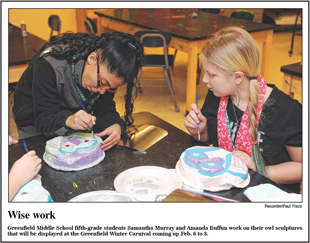 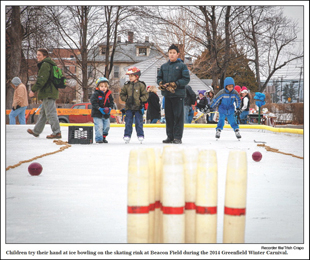 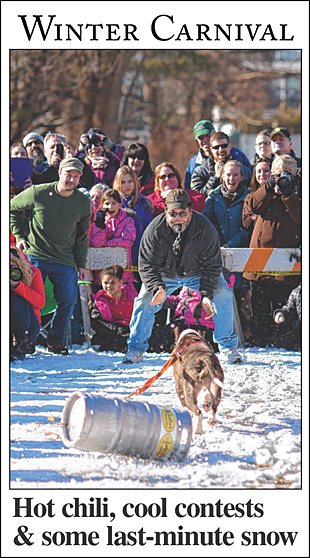 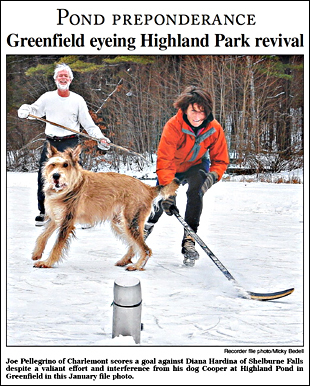 Photographing a winter wonderland – Each year, the Greenfield Recorder holds an amateurphotography contest and exhibit as part of the annual Winter Carnival. Three winners in the color category and three winners in the black-and-white category are chosen, this year from a crop of 81 entries. 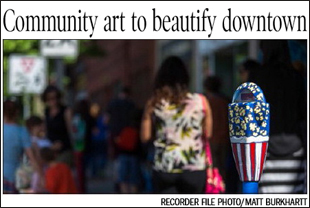 The winners are on display with other submissions at Wilson’s Department Store, Studio C, in Greenfield, through Saturday, Feb. 16. 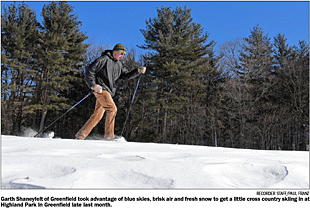 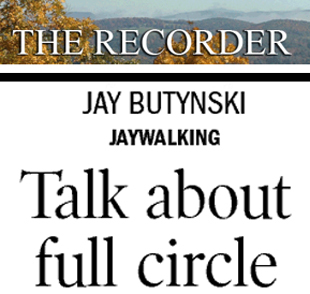 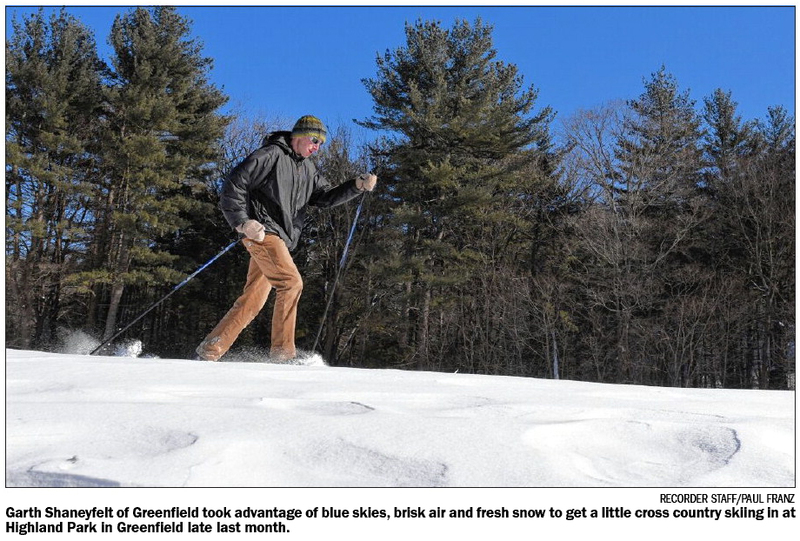 All photos depict winter subjects and scenes in the Franklin County/North Quabbin region. 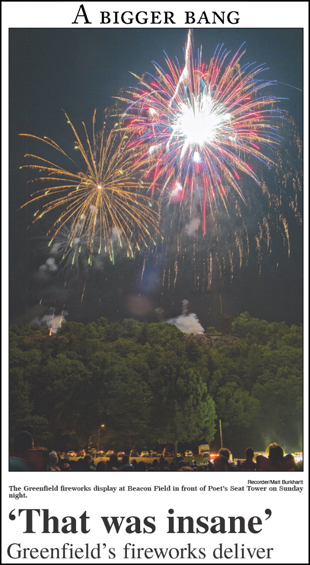 • Josh Spring of Colrain took second place for this color photo taken on his property. 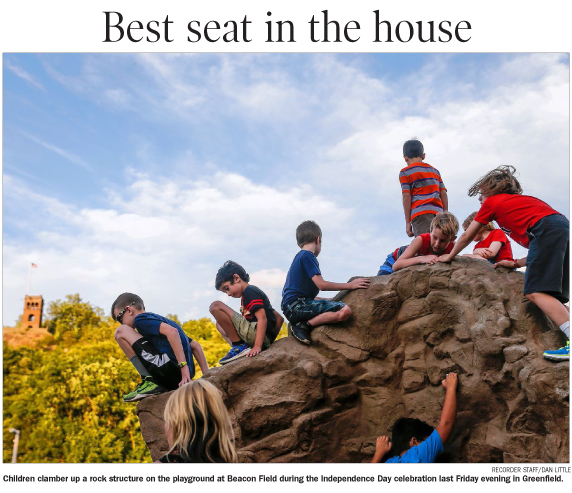 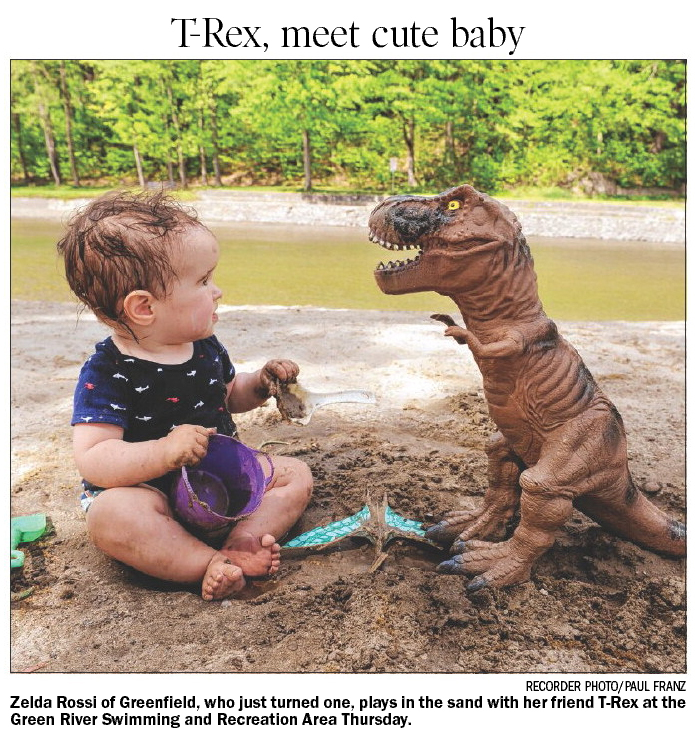 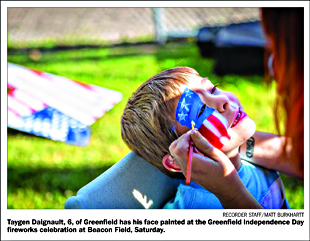 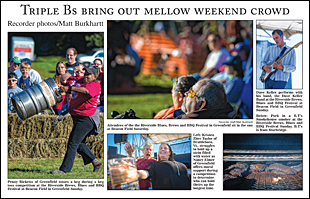 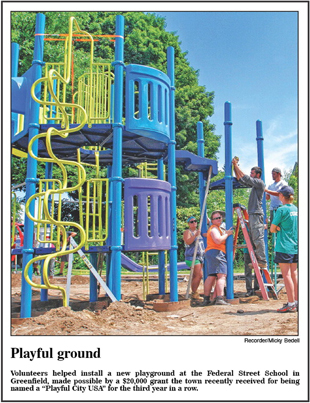 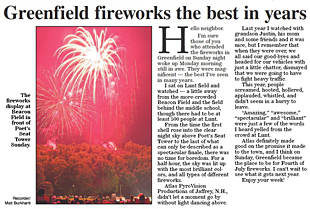 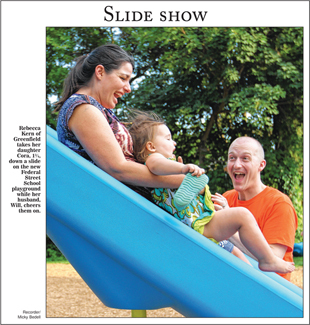 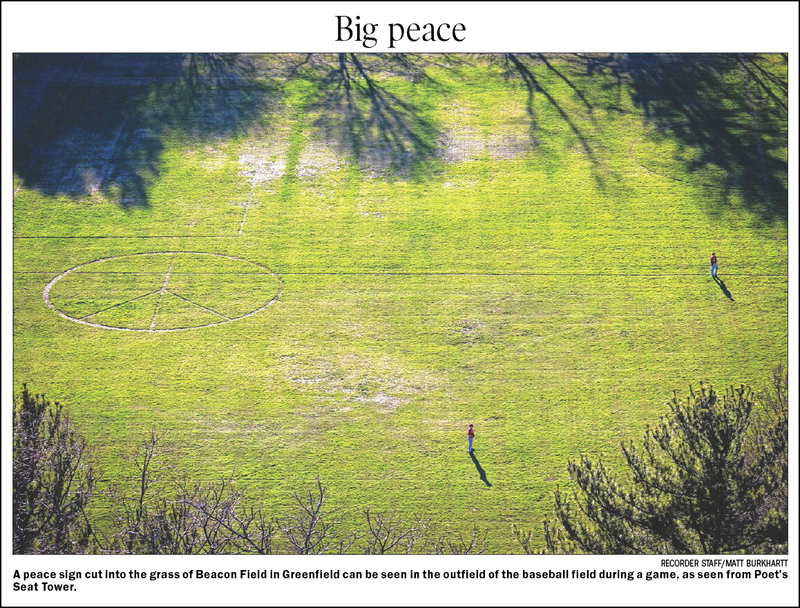 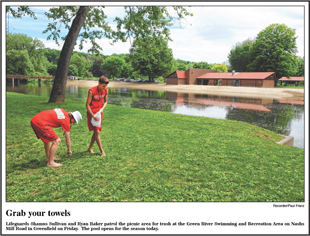 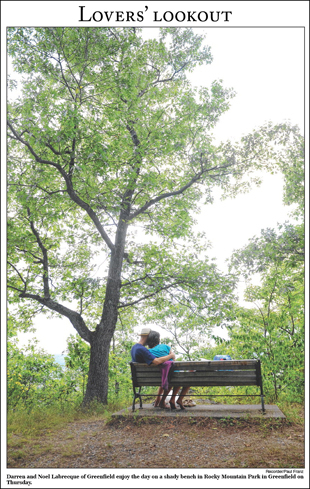 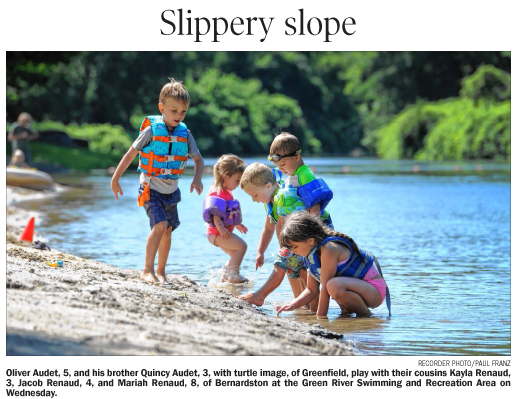 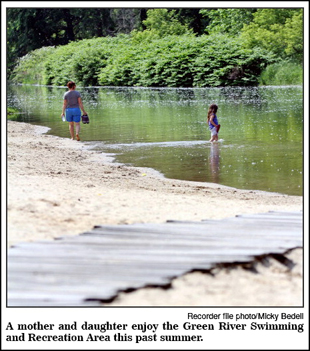 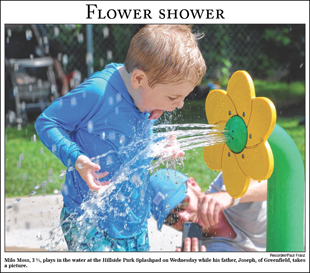 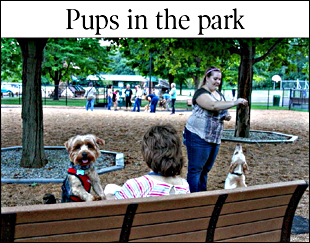 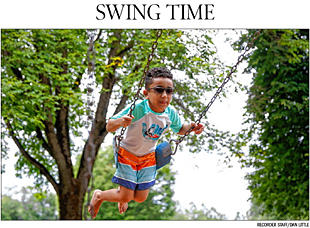 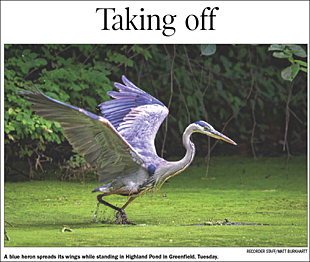 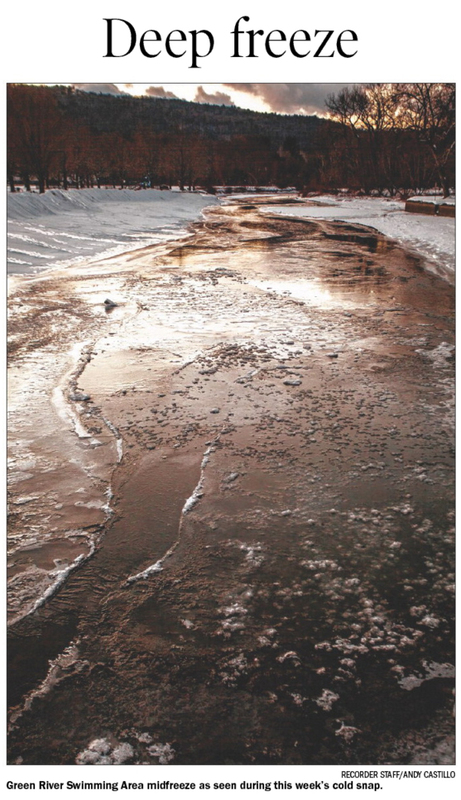 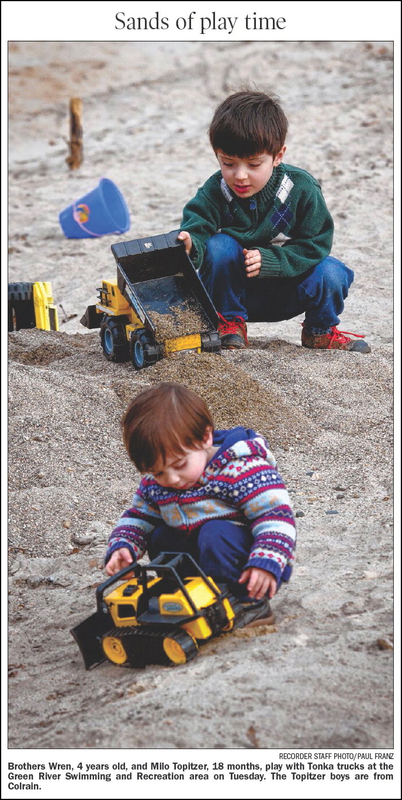 • Northfield resident Melanie Phillips won third place for her colorphoto of playing fields in Deerfield. 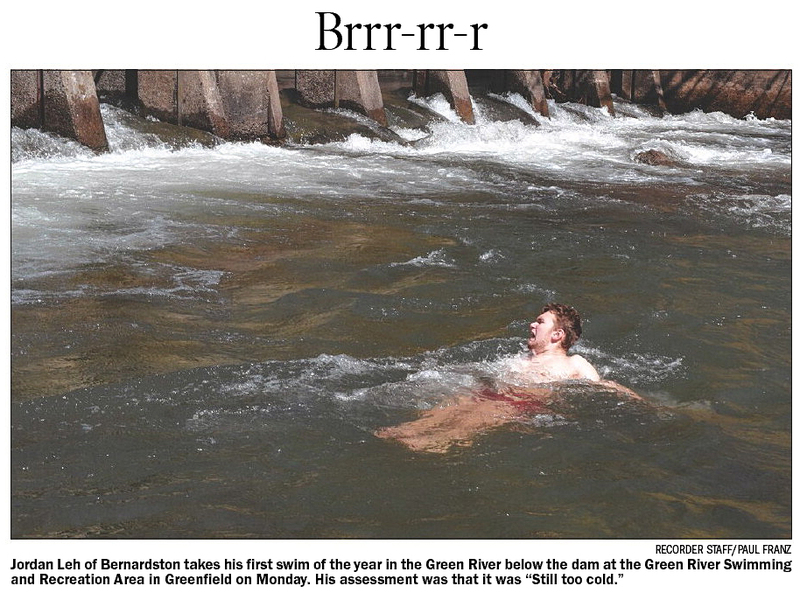 • Melissa Murphy won second place for her black-and-white photo of Doane’s Falls in Royalston. 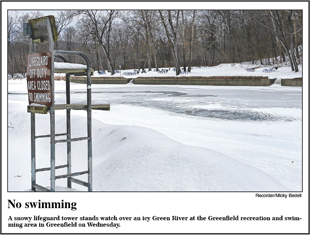 • Brian Foley of Greenfield won third place for his black-and-white photo of a gull on a frozen Barton Cove. 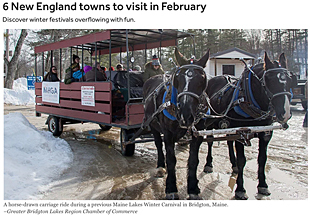 6 New England towns to visit in February - Discover winter festivals overﬂowing with fun. 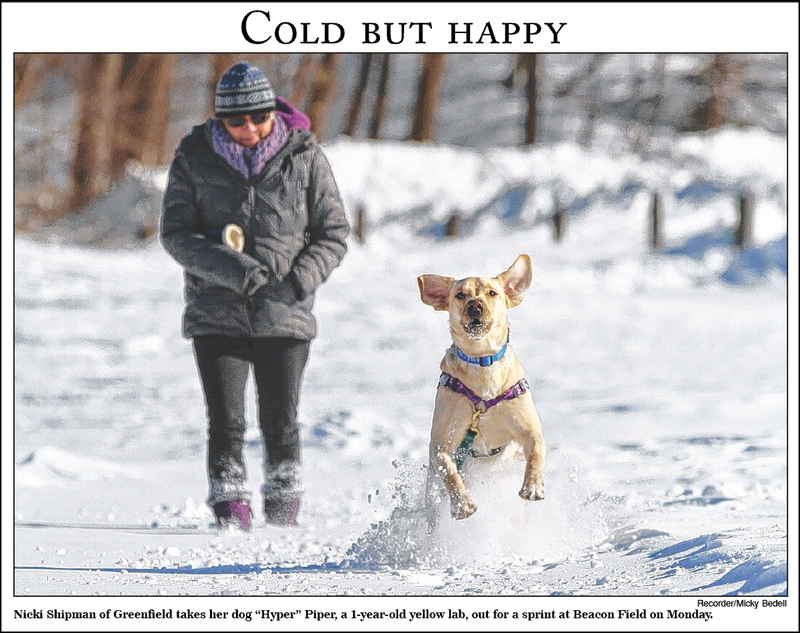 Obvious alert: It’s freezing outside. 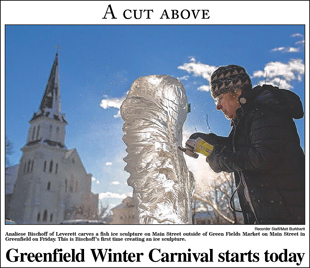 However, you shouldn’t let that stop you from taking advantage of the ice sculpture-, snowshoe-, and s’mores-ﬁlled festivals taking place across the region this month. 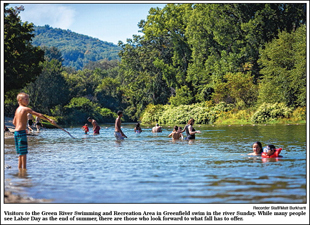 As summer ends . 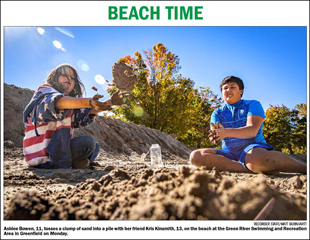 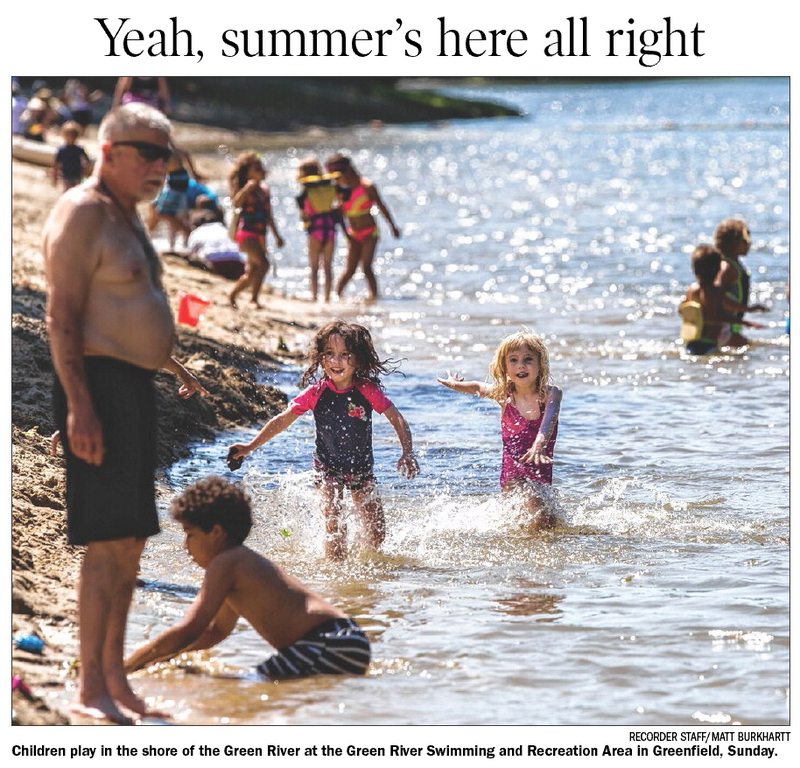 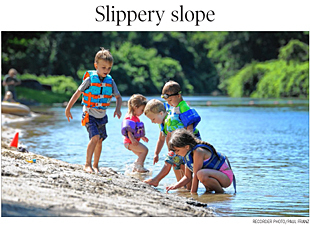 . . we can still find fun in the sun – Jose Carlos, center, makes sandcastles with Jose Carlos Jr., 3, left, and Merelin Rodriguez, 7, at the Green River Swimming and Recreation Area in Greenfield on Saturday. 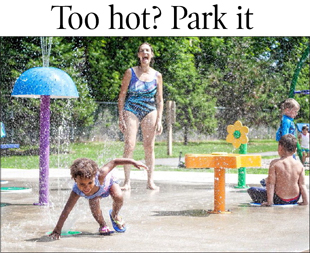 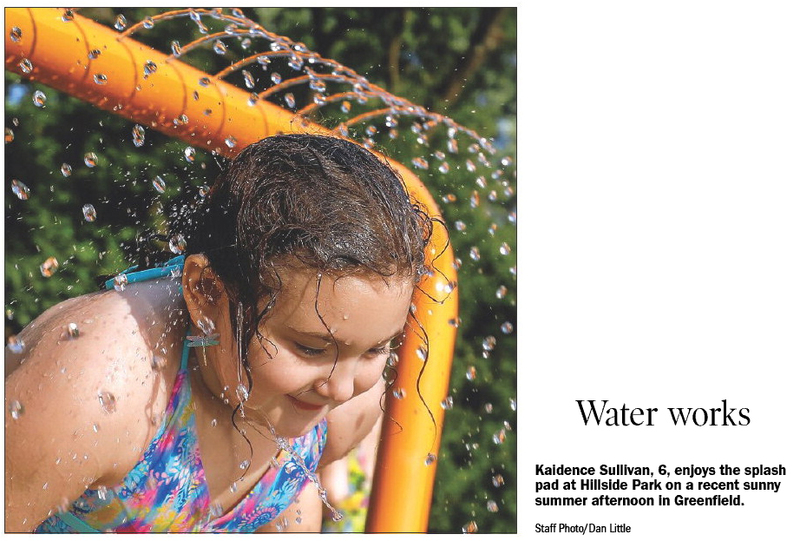 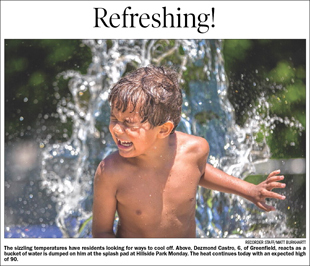 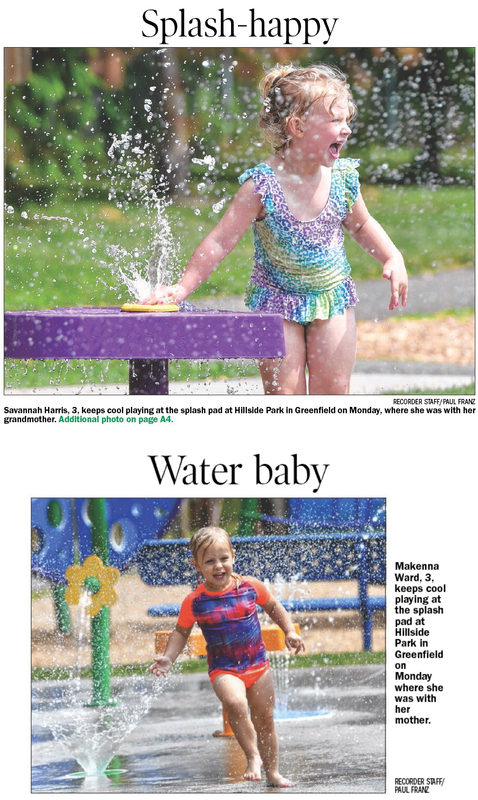 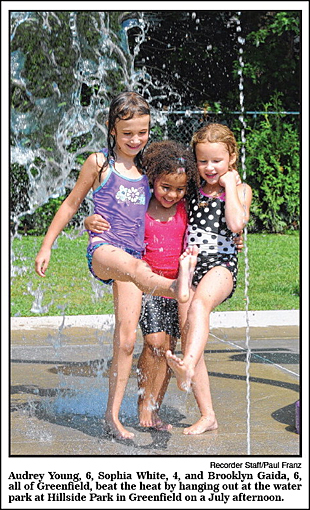 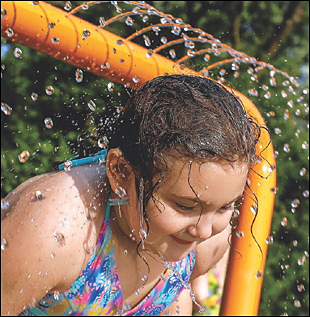 Splash-happy – Savannah Harris, 3, keeps cool playing at the splash pad at Hillside Park in Greenfield on Monday, where she was with her grandmother. 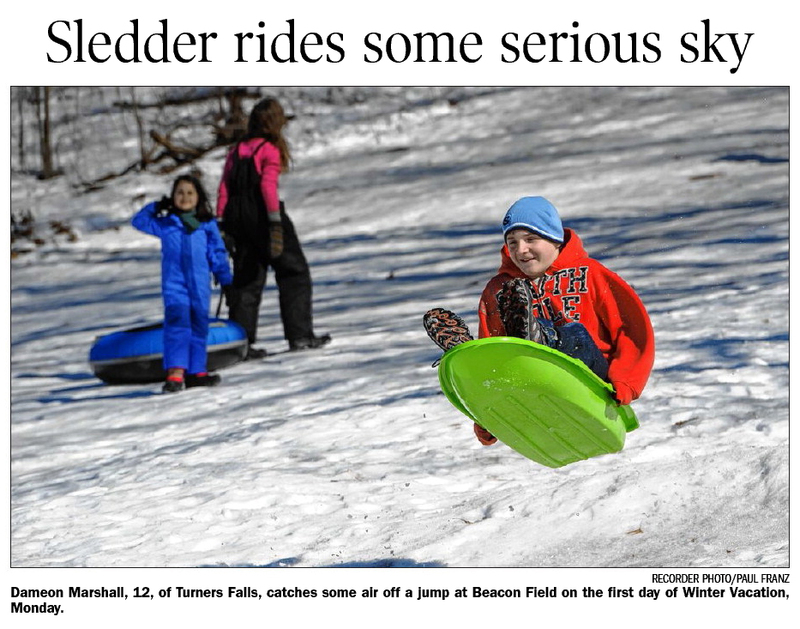 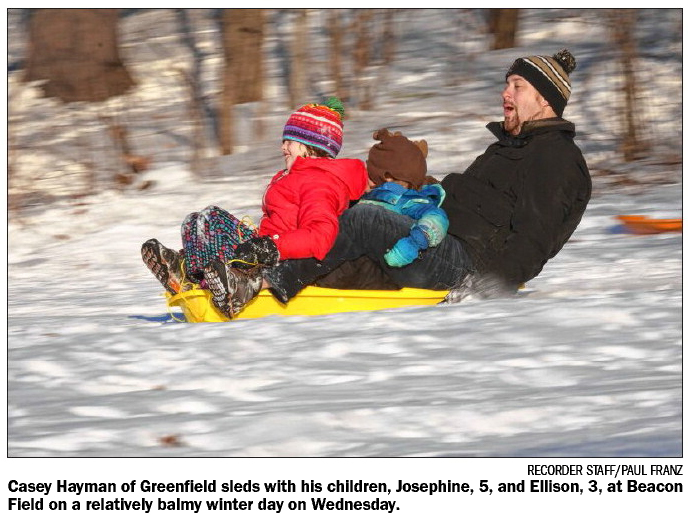 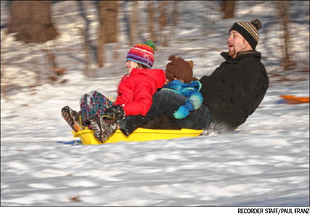 A classic tandem ride on a classic runner sled at Beacon Field during a snow day from school, January 17th. 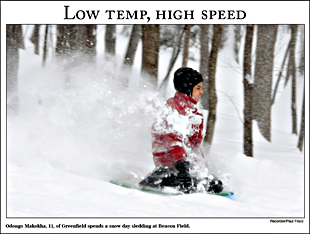 August Zaccara, 10, of Greenfield snowboards at Beacon Field on Wednesday, January 17th. 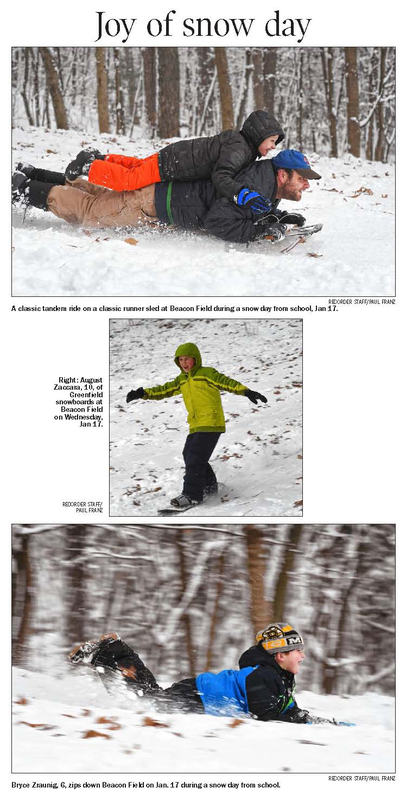 Bryce Zraunig, 6, zips down Beacon Field on January 17th during a snow day from school. A frightfully good time – Goblins, ghouls and ninja turtles took over the town Halloween night during the Greenfield Recreation Department’s Rag Shag Parade. 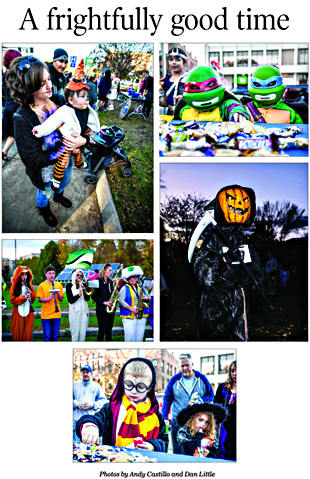 Clockwise from top, left: Milaina McMahon, 8 months, is held by mother Nicole McMahon; ninja turtles Kaylee Gonzalez, 3, and Jayden Gonzalez, 2, reach for candy; 4-year-olds Milo Mimitz and Helen Martineau trick or treat; Ayden Whalen, 11, as a pumpkin reaper; members of the Greenfield High School band perform Halloween-themed music at Energy Park. 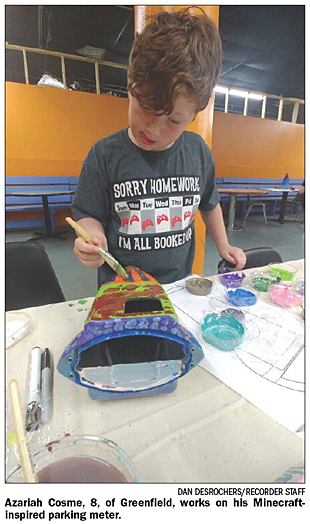 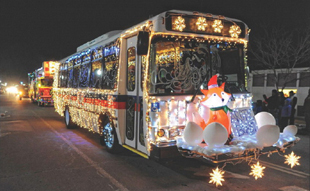 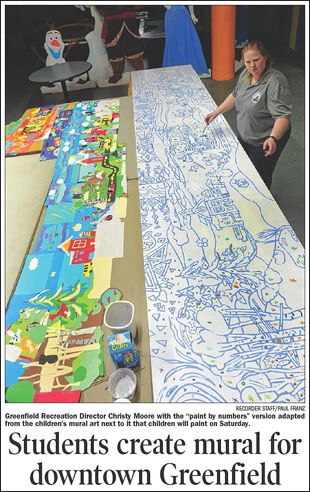 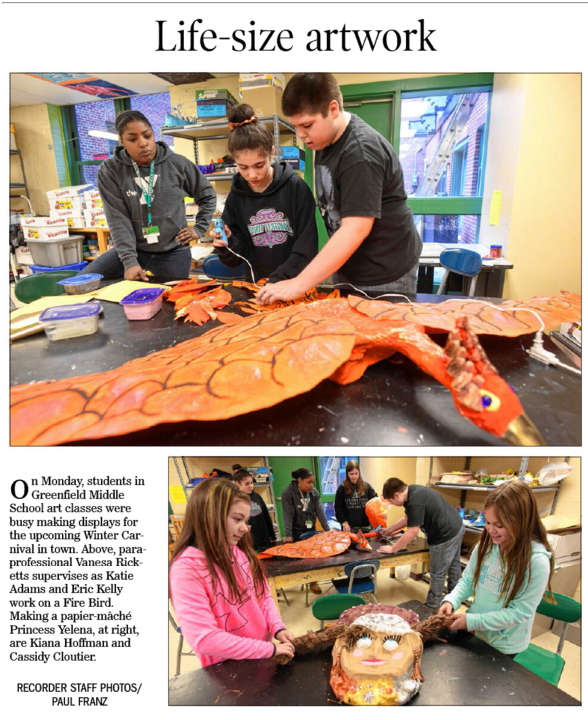 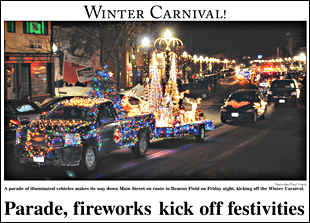 Best Homemade — First place: Elephant, Anira Dahlstrom, Greenfield; Second place: Phoenix, Phoebe Wondolowski, Greenfield. 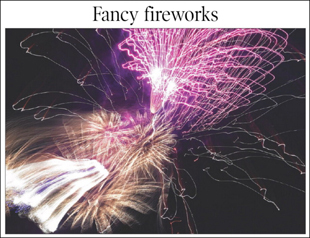 Most Original — First place: Cotton candy, Jake Mattson, Colrain; Second place: Mermaid, Amber Kowal, Leyden. 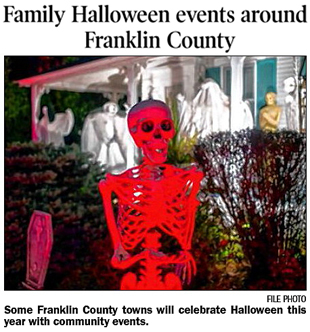 Scariest — First place: The Corpse Bride, Breanne Biggs, Orange; Second place: The Pumpkin Reaper, Ayden Whalen, Heath. 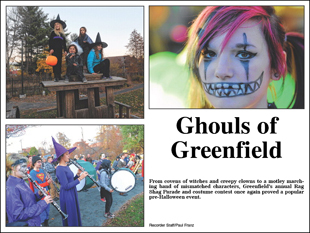 Cutest — First place: Witch, Celia Despres, Greenfield; Second place: Clown, Aza Toma-Thompson, Greenfield. 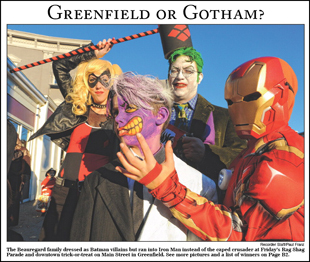 Best Cartoon Character — First place: Harley Quinn, Skyler Regan, Bernardston; Second place: Iron Man, Sigurd Hyatt, Erving. 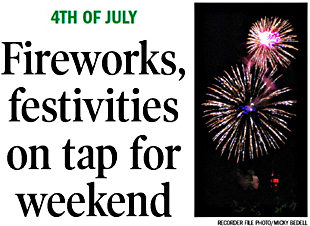 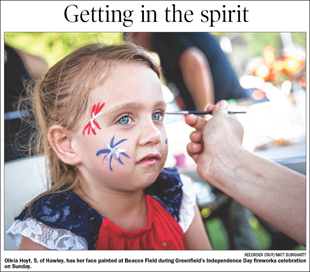 Adult — First place: Cruella de Vil, Julia Ellingboe, Greenfield; Second place: Miss Liberty, Mareba Jos, Greenfield. 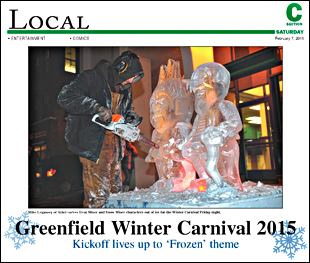 Greenfield Winter Carnival ice sculptures – Artists armed with chainsaws and chisels turned giant blocks of ice into sculptures of a seal, a polar bear, a trout and the abominable snowman on Friday for the city's annual winter carnival. 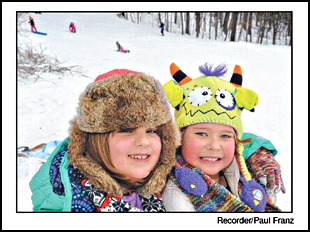 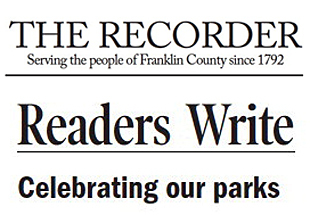 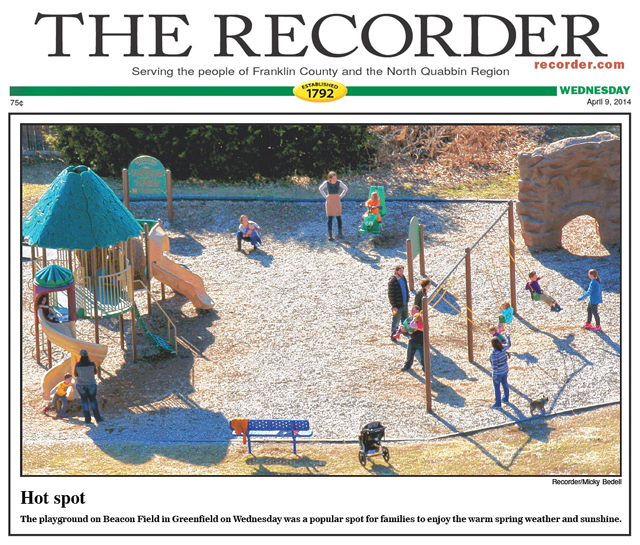 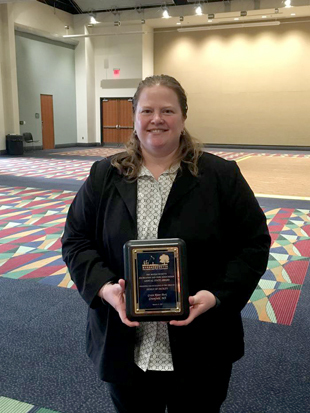 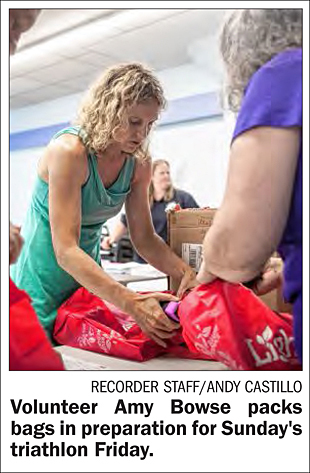 A winter’s tale in photos – Recorder contest winners capture Franklin County – Each year, The Recorder holds an amateur photography contest and exhibit. 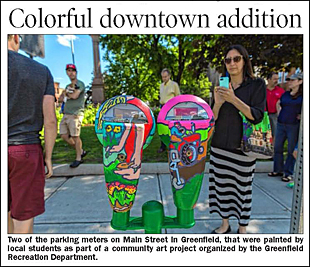 The winners have been chosen for 2017 and are on display with other submissions in Studio C on the third floor of Wilson’s Department Store on Main Street in Greenfield. 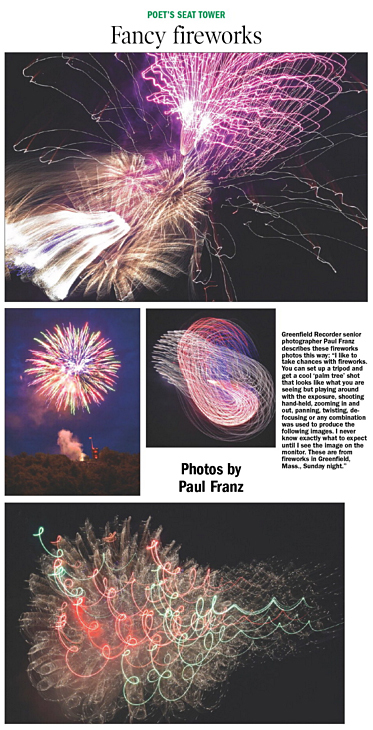 There were three winners in the color category and three winners in the black-and-white category. 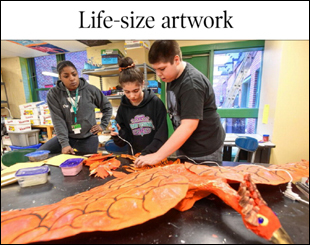 Photos will be on display until Saturday, Feb. 11. 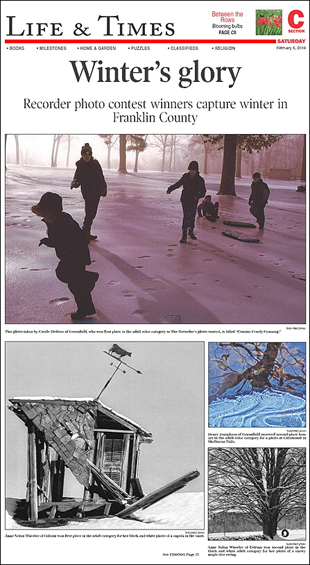 All photos depict winter subjects and scenes throughout Franklin County. 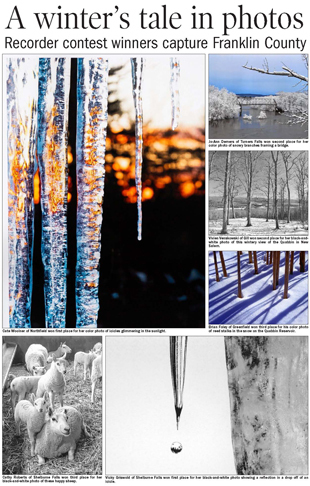 Cate Woolner of Northfield won first place for her color photo of icicles glimmering in the sunlight. 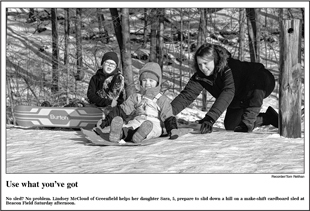 Vicky Griswold of Shelburne Falls won first place for her black-and-white photo showing a reflection in a drop off of an icicle. 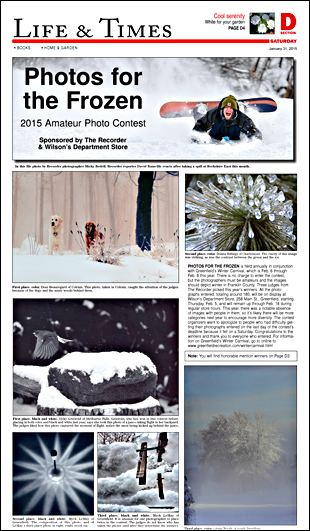 Jo-Ann Demers of Turners Falls won second place for her color photo of snowy branches framing a bridge. 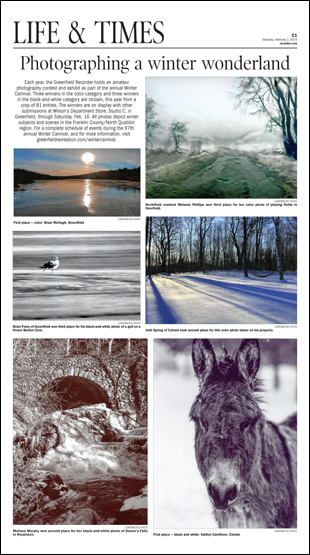 Vivien Venskowski of Gill won second place for her black-andwhite photo of this wintery view of the Quabbin in New Salem. 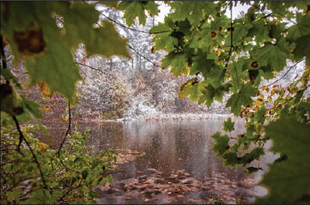 Brian Foley of Greenfield won third place for his color photo of reed stalks in the snow on the Quabbin Reservoir. 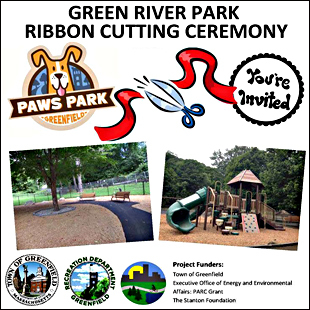 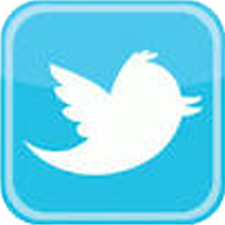 Thursday, September 15th - GREEN RIVER PARK RIBBON CUTTING CEREMONY – 6:00 p.m. – Come on out and help us celebrate! 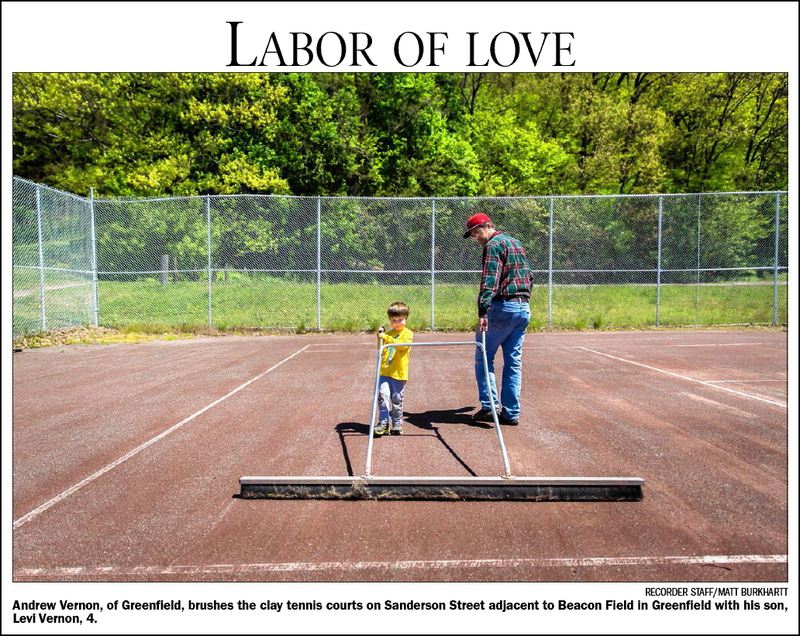 This was a big project and we are so very proud of how beautifully it came out. 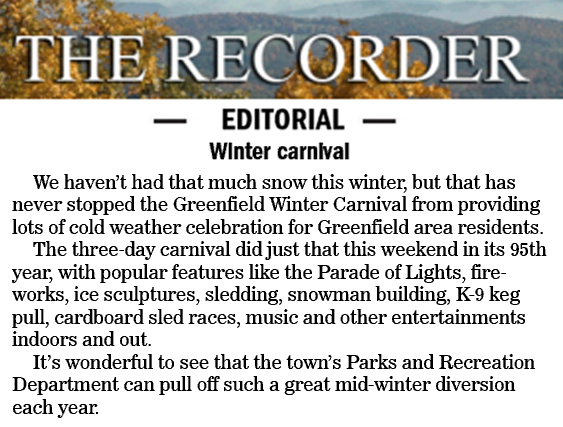 Winter’s glory - Recorder photo contest winners capture winter in Franklin County – Sponsored by The Recorder & Wilson’s Department Store – This Amateur Photo Contest is held annually in conjunction with Greenfield’s Winter Carnival, which is Feb. 5 through Feb. 7 this year. 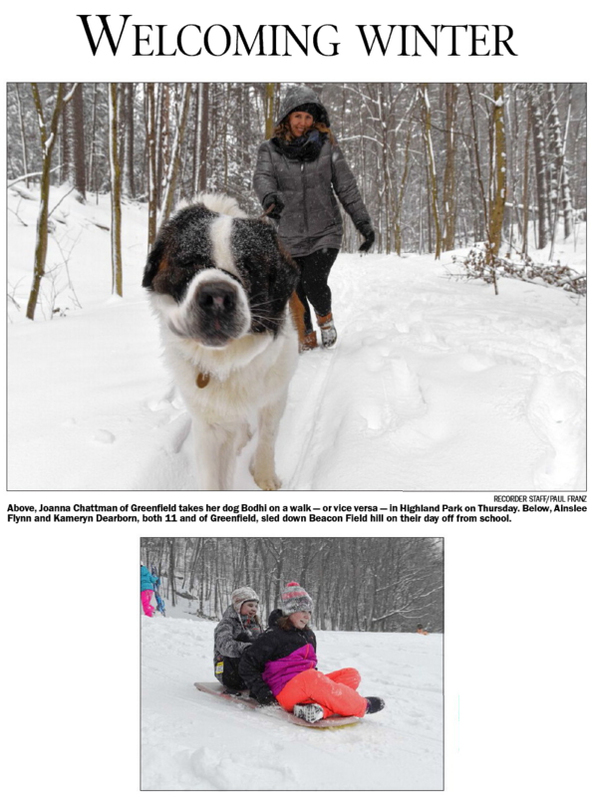 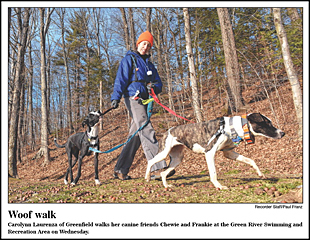 There is no charge to enter the contest, but the photographers must be amateurs and the images should depict winter in Franklin County. 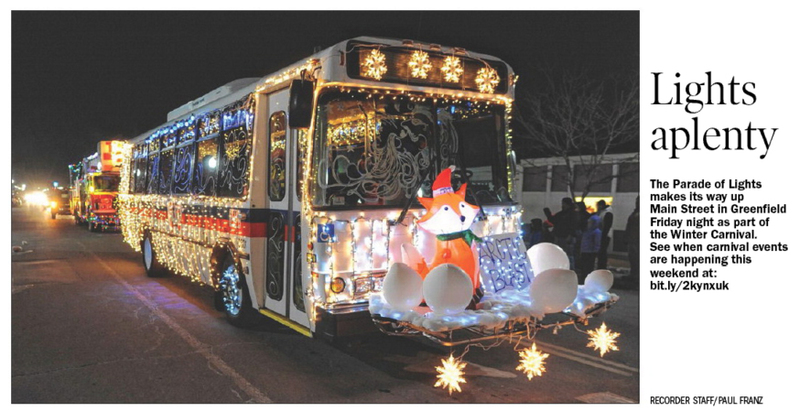 Carole DeRose of Greenfield won first place in the adult color category for “Cousins Crusty-Cruising”. 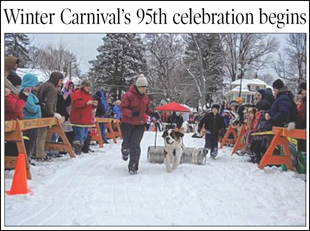 Anne Nolan Wheeler of Colrain won first place in the adult category for her black and white photo of a cupola in the snow. 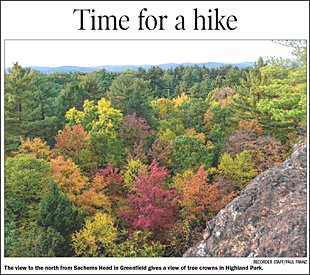 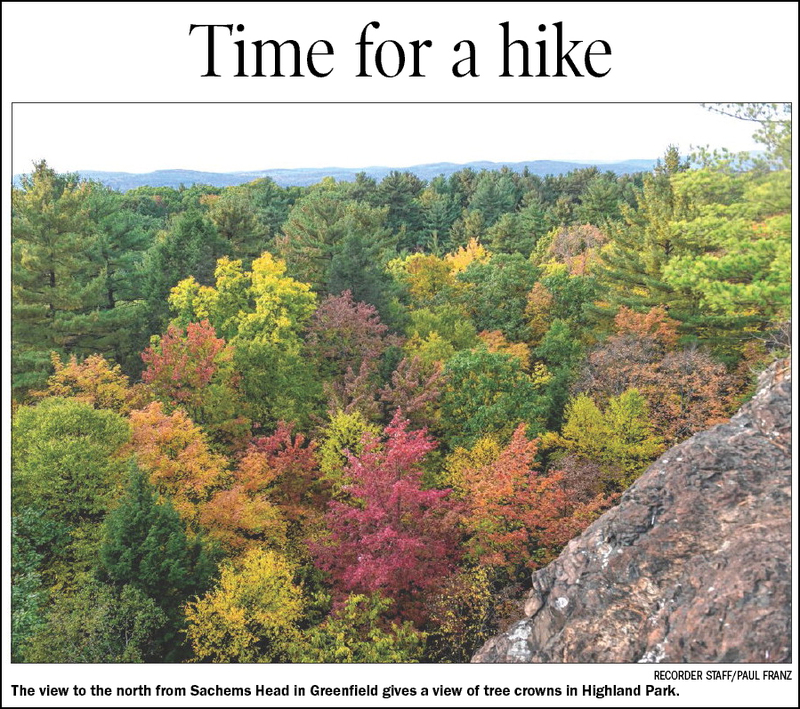 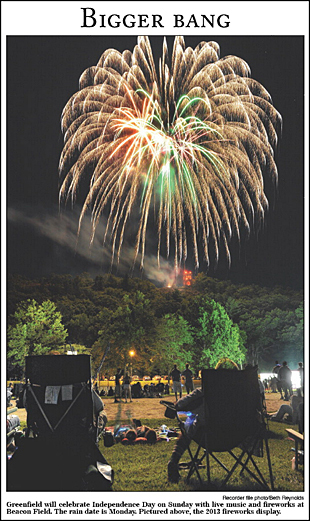 Henry Josephson of Greenfield received second-place honors in the adult color category for a photo at Catamount in Shelburne Falls. 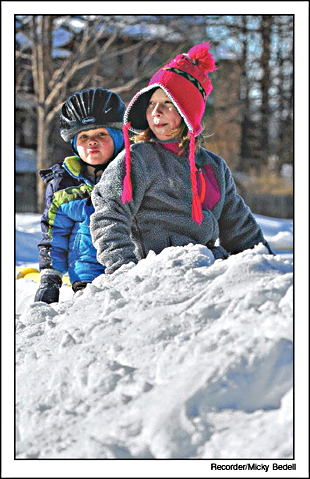 Anne Nolan Wheeler of Colrain won second place in the black and white adult category for her photo of a snowy maple tire swing. Phoebe Broussard of Greenfield won first place in youth category for her photo of a woodpecker perched at a feeder at her grandparents’ home in Vermont. 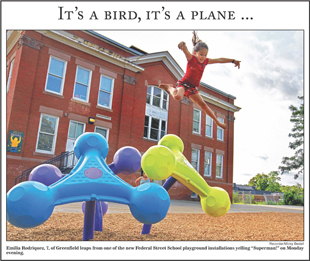 Henry Mixsell of Greenfield received third place in the adult color category for his photo of horses at Stonelegh Burnham School. 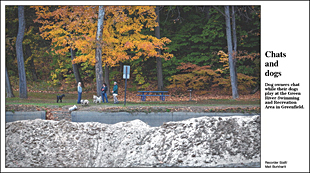 Henry Josephson of Greenfield won third place in the adult black and white category for his photo of a stonewall at Catamount. 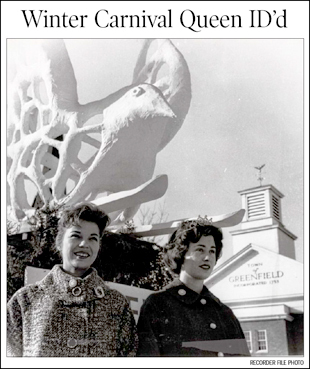 All the winners photos will appear in Studio C on the third floor of Wilson’s Department store. 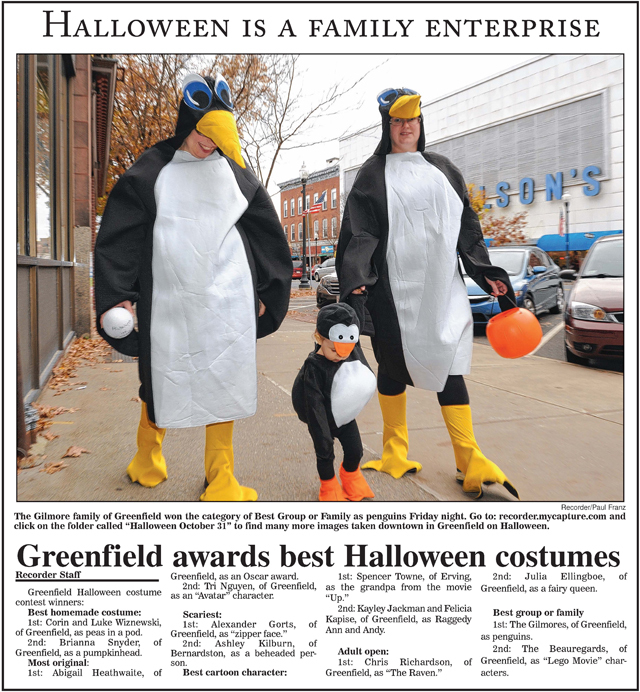 Ghouls of Greenfield - Greenfield Rag Shag contest winners – From covens of witches and creepy clowns to a motley marching band of mismatched characters, Greenfield’s annual Rag Shag Parade and costume contest once again proved a popular pre-Halloween event. 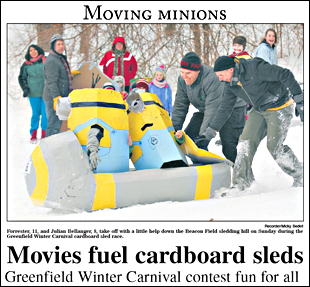 2nd place: The Dahlstrom-Hakki family of Greenfield, Star Wars . 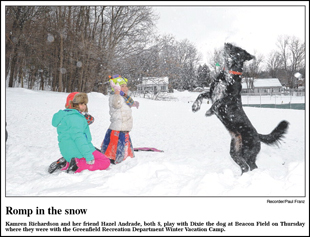 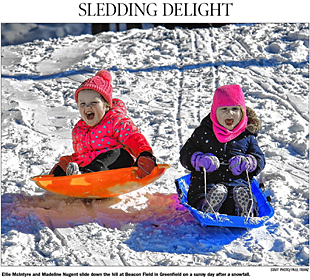 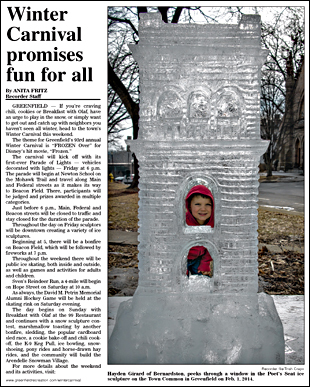 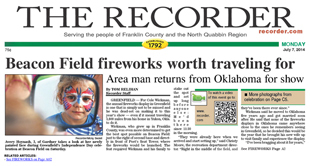 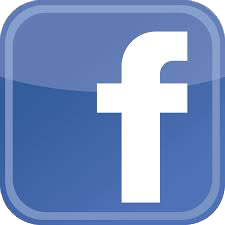 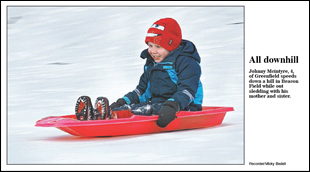 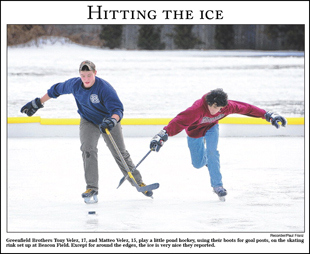 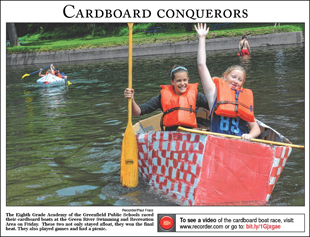 PHOTOS FOR THE FROZEN 2015 – Sponsored by The Recorder & Wilson’s Department Store – This Amateur Photo Contest is held annually in conjunction with Greenfield’s Winter Carnival, which is Feb. 6 through Feb. 8 this year. 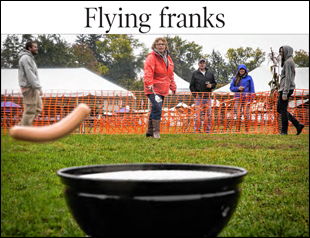 There is no charge to enter the contest, but the photographers must be amateurs and the images should depict winter in Franklin County. 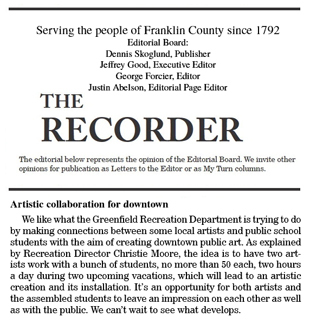 Three judges from The Recorder picked this year’s winners. 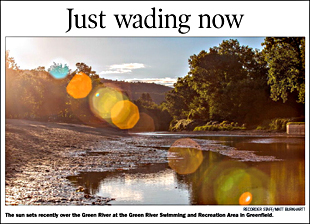 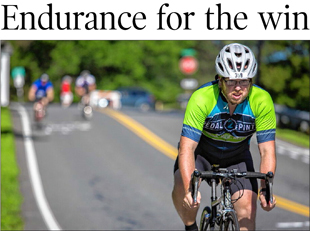 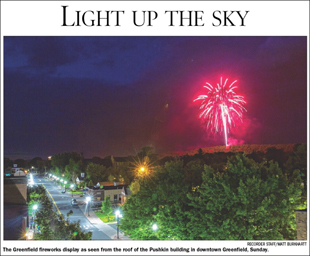 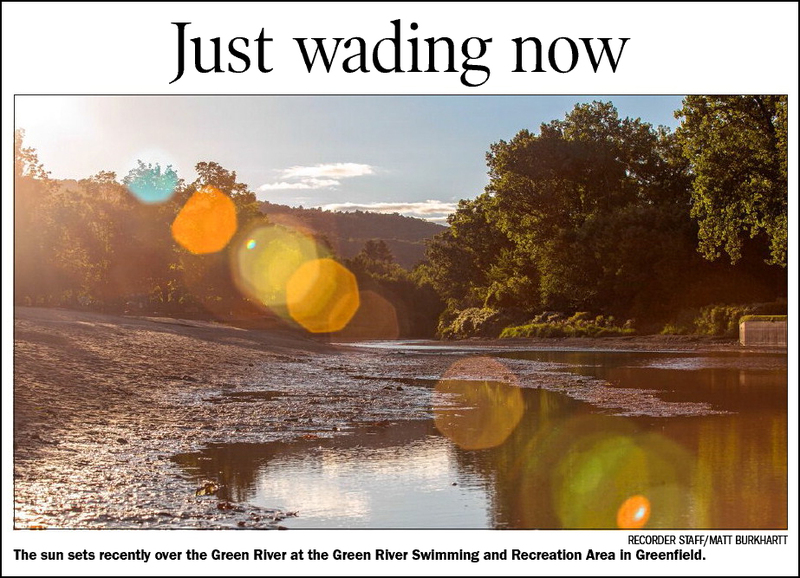 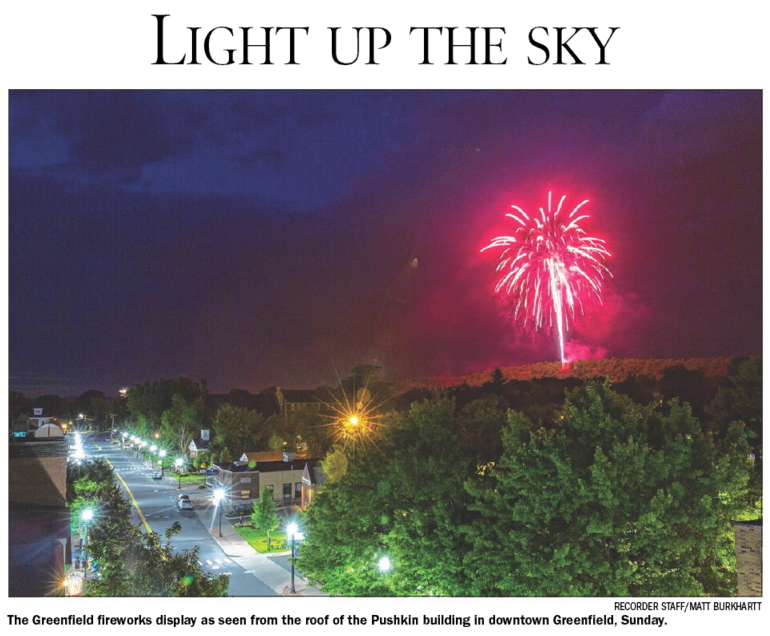 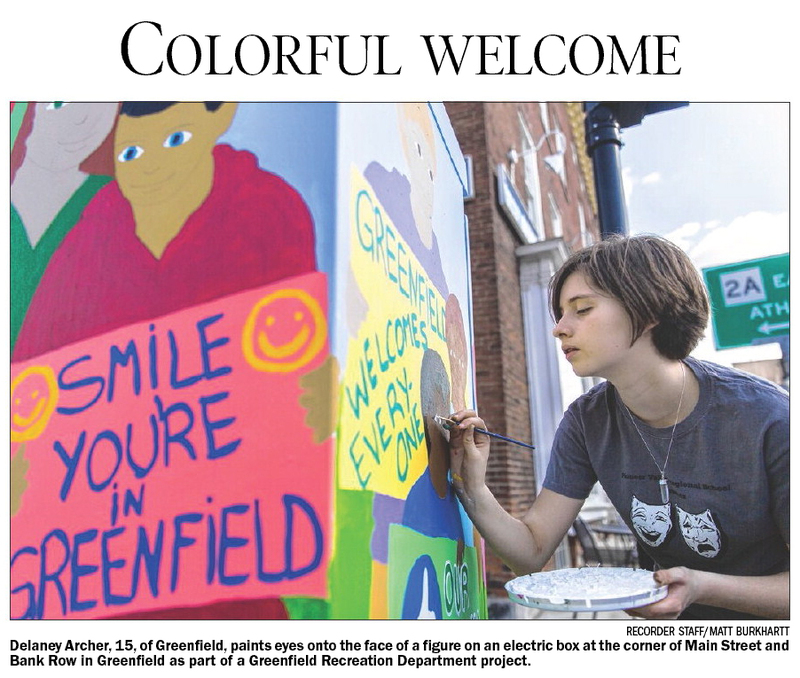 All the photographs entered, totaling around 180, will be on display at Wilson’s Department Store, 258 Main St., Greenfield, starting Thursday, Feb. 5, and will remain up through Feb. 18 during regular store hours. 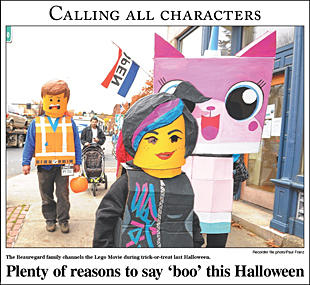 This year, there was a notable absence of images with people in them, so it’s likely there will be more categories next year to encourage more diversity. 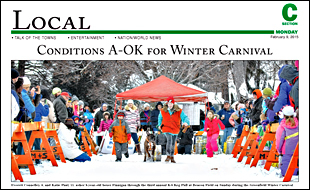 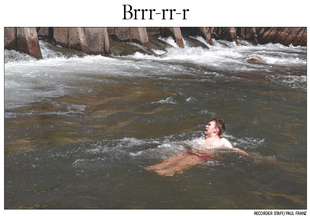 The contest organizers want to apologize to people who had difficulty getting their photographs entered on the last day of the contest’s deadline because it fell on a Saturday. 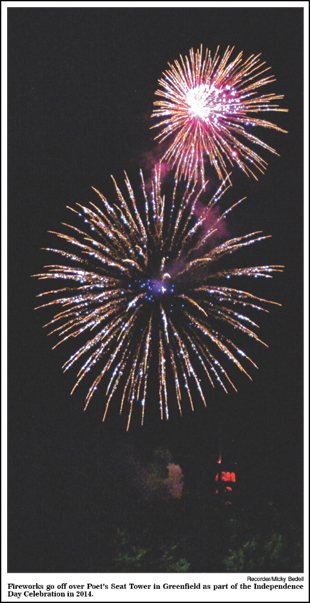 Congratulations to the winners and thank you to everyone who entered. 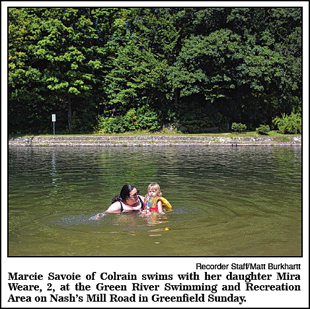 First place, color, Doni Beauregard of Colrain. 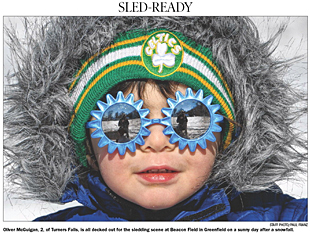 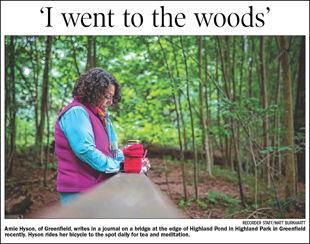 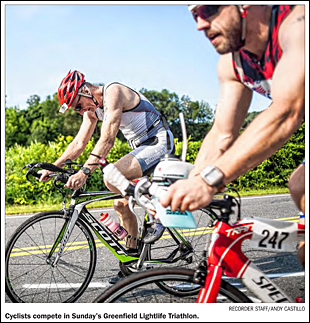 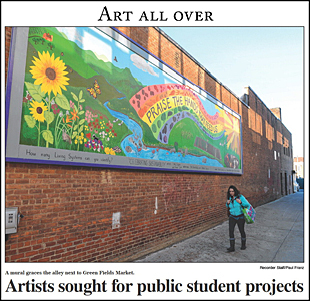 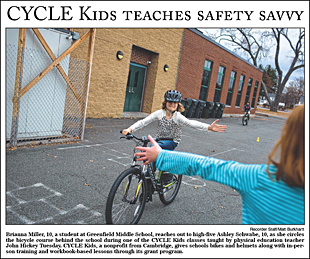 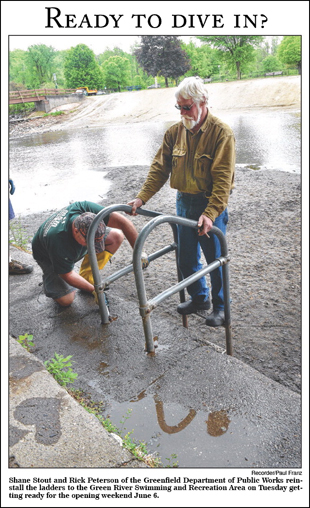 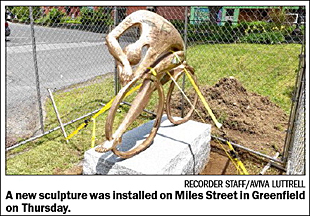 First place, black and white, Vicky Griswold of Shelburne Falls. 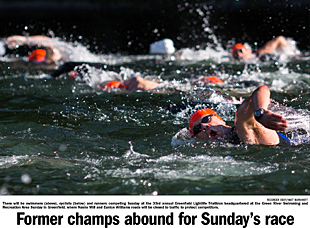 Second place, black and white, Myck LeMay of Greenfield. 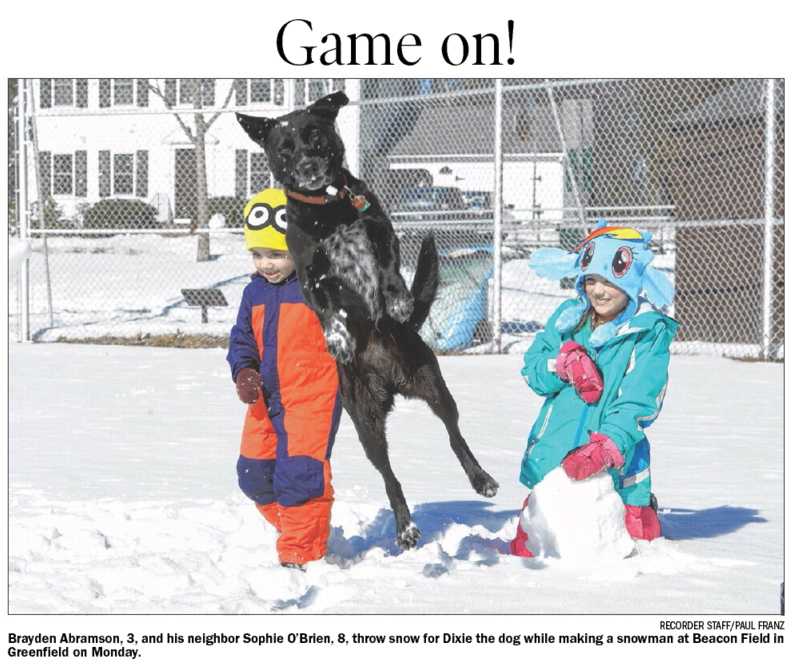 Second place, color, Donna Billings of Charlemont. Third place, color, Glenn Woods of South Deerfield. 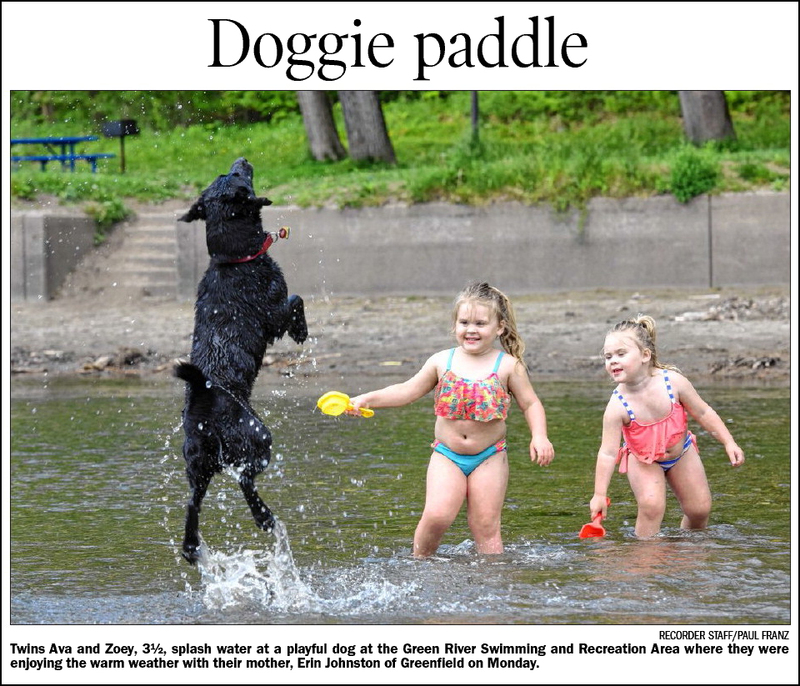 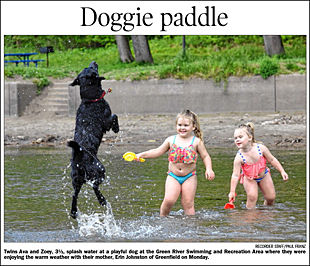 Third place, black and white, Myck LeMay of Greenfield. 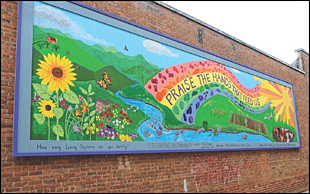 Honorable mention, color, Richard Rockstroh of Colrain. 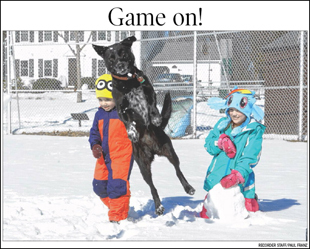 Honorable mention, black and white, Vicky Griswold of Shelburne Falls. 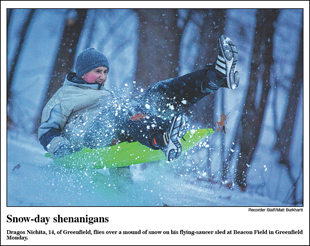 1st: Corin and Luke Wiznewski, of Greenfield, as peas in a pod. 2nd: Brianna Snyder, of Greenfield, as a pumpkinhead. 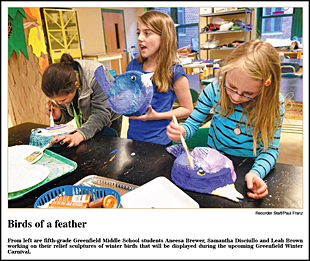 1st: Abigail Heathwaite, of Greenfield, as an Oscar award. 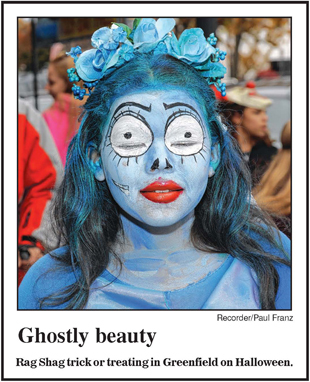 2nd: Tri Nguyen, of Greenfield, as an “Avatar” character. 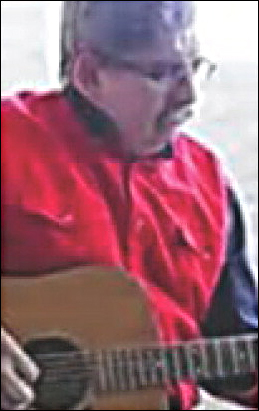 2nd: Ashley Kilburn, of Bernardston, as a beheaded person. 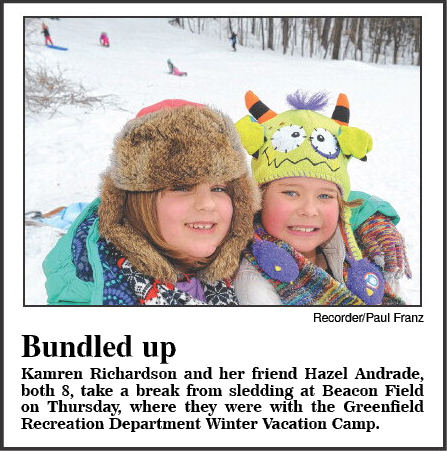 2nd: Kayley Jackman and Felicia Kapise, of Greenfield, as Raggedy Ann and Andy. 2nd: Julia Ellingboe, of Greenfield, as a fairy queen. 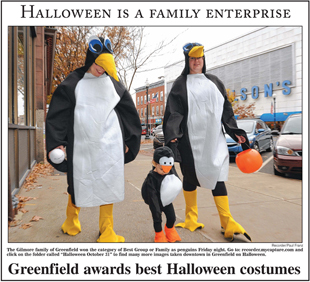 1st: The Gilmores, of Greenfield, as penguins. 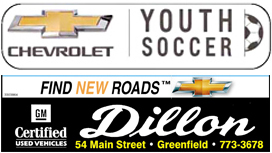 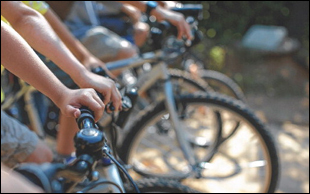 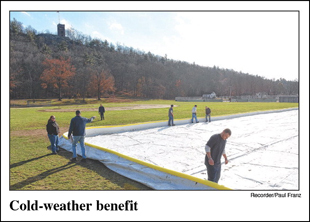 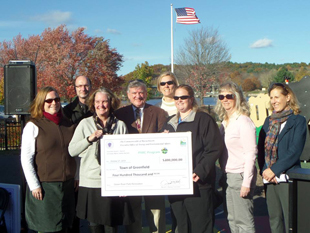 Valley Gives Day – The Friends of Greenfield Recreation will be participating in Valley Gives Day on December 10, 2014 - a 24 hour e-philanthropy event for the Pioneer Valley. 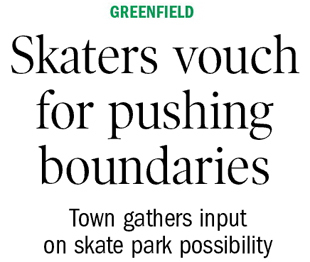 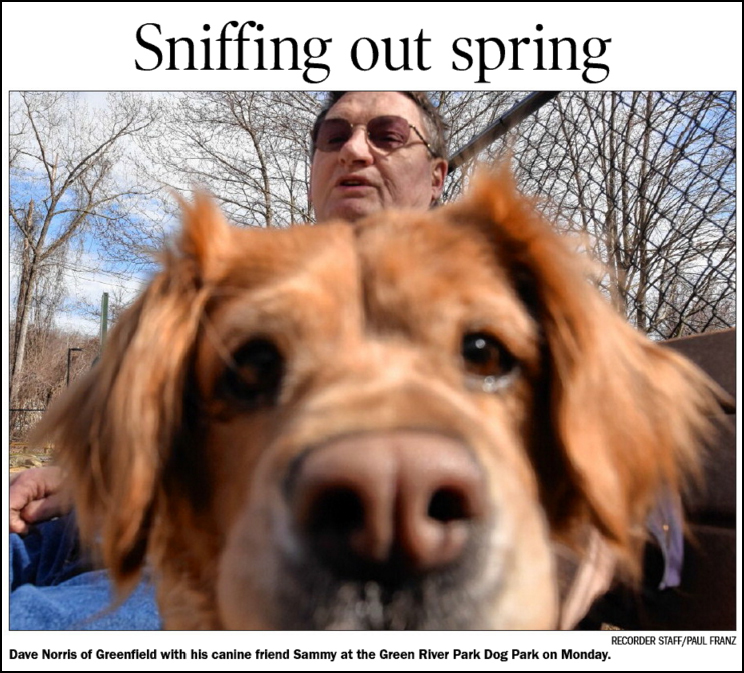 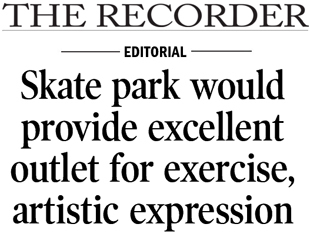 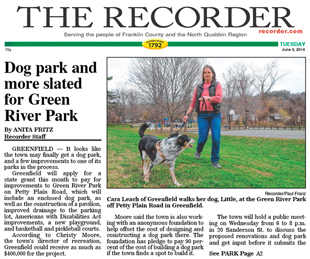 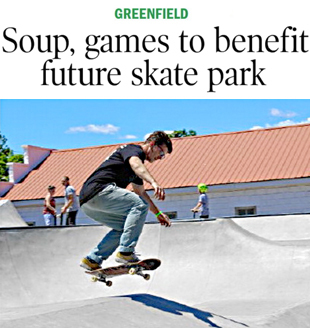 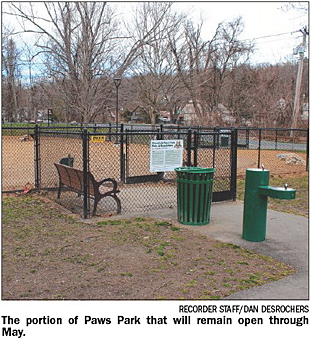 Please support the Friends of Greenfield Recreation, or one of their many fundraising campaigns for the Paws Park, Skate Park, Rejuvenators, and the Energy Park! 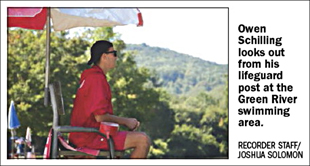 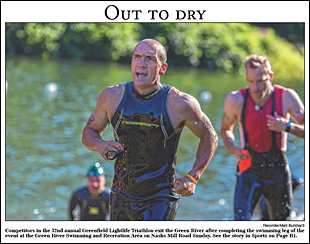 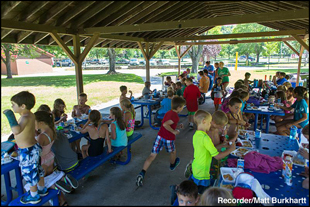 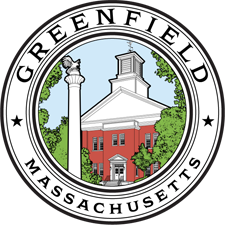 The Friends of Greenfield Recreation are able to help financially support all of the great programs and events run by the Recreation Department thanks to community donors like you. 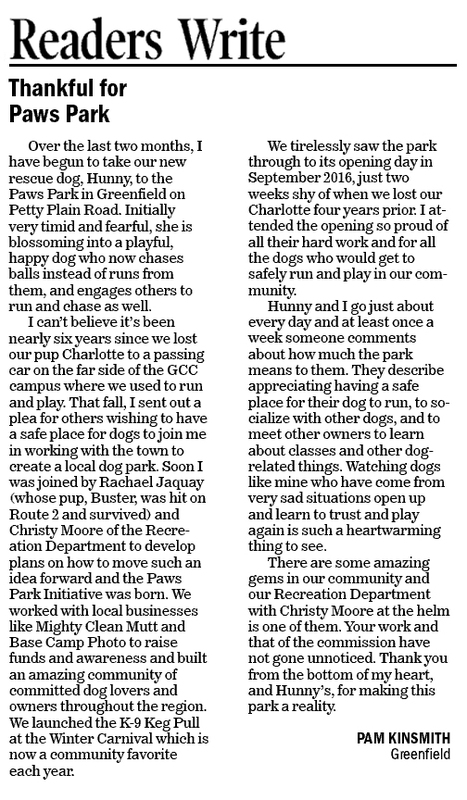 Together, we can do more. 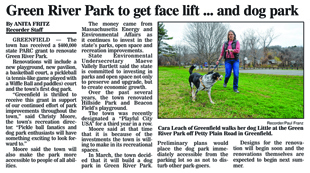 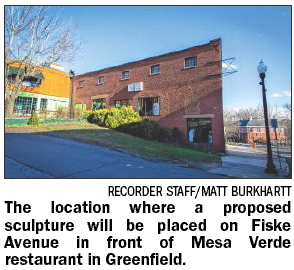 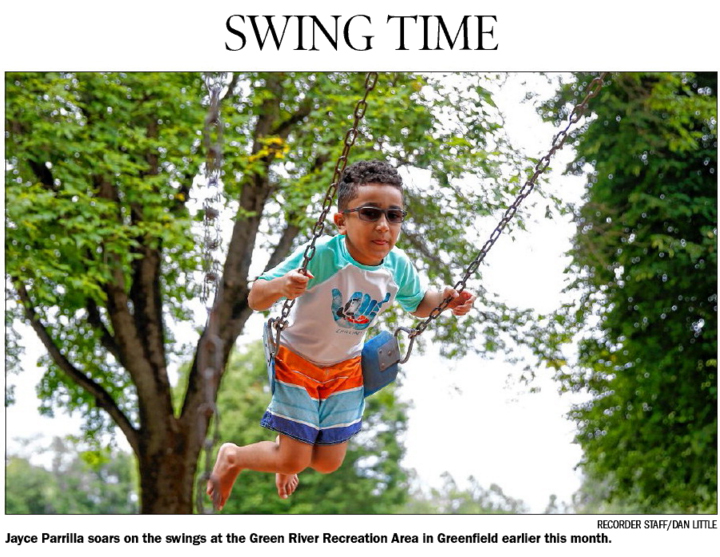 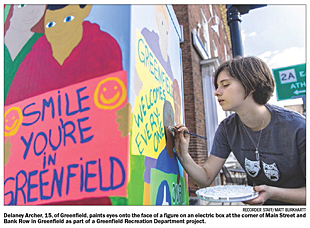 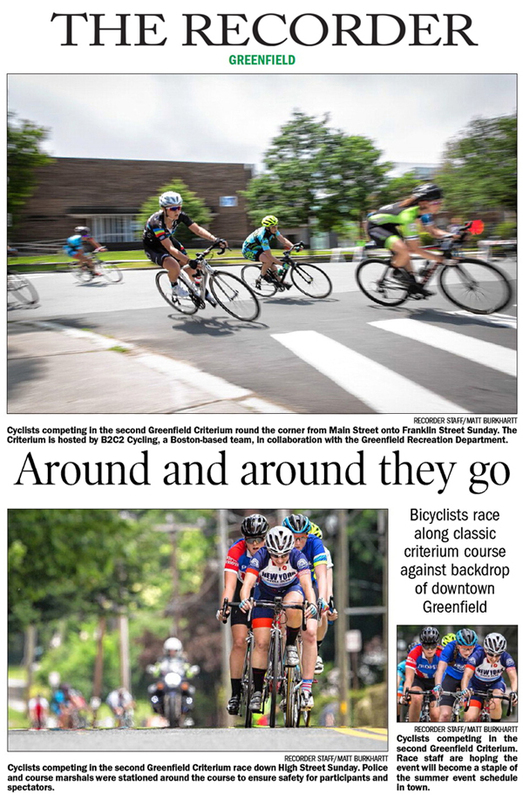 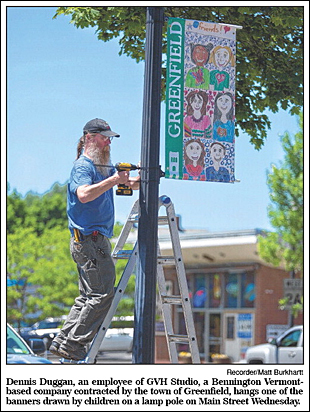 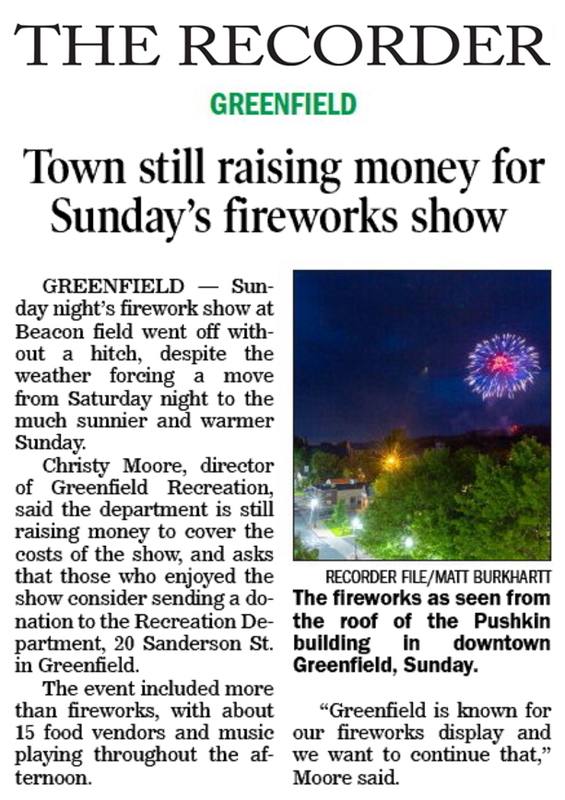 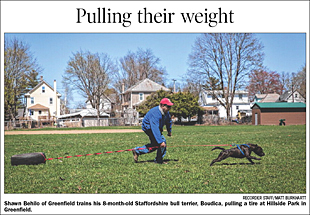 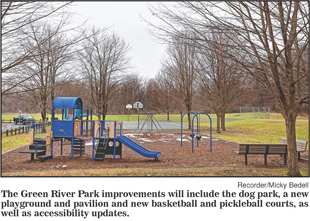 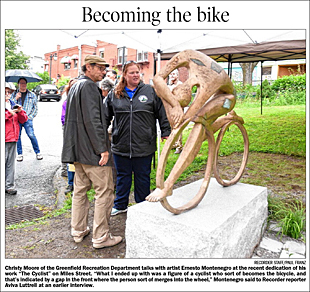 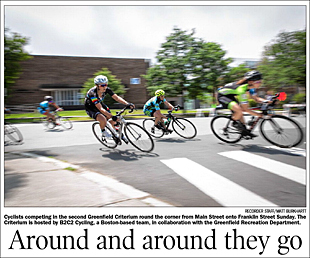 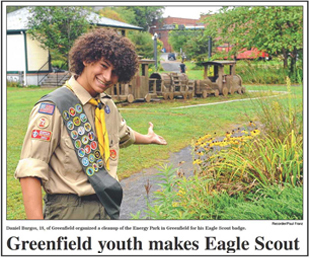 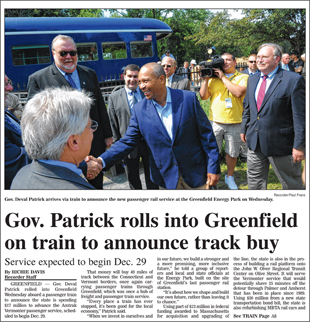 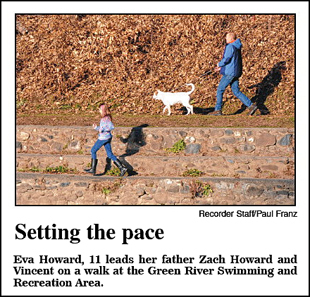 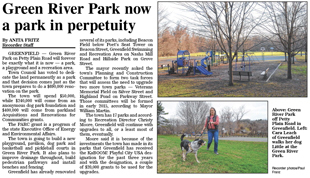 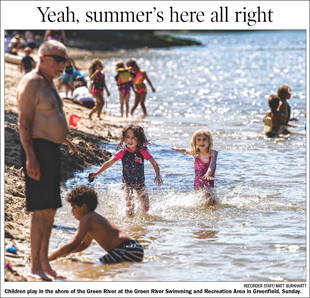 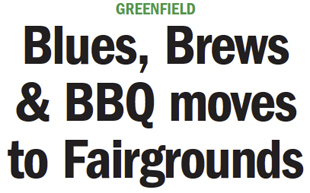 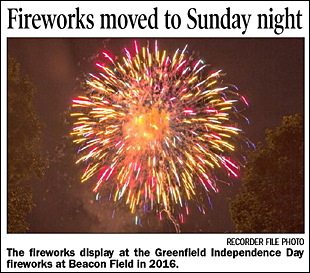 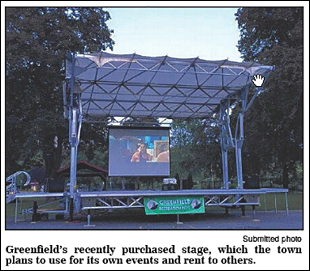 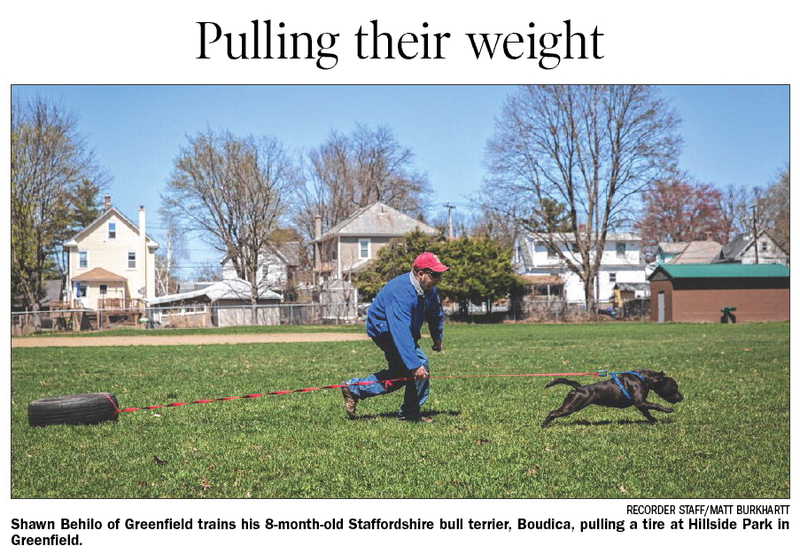 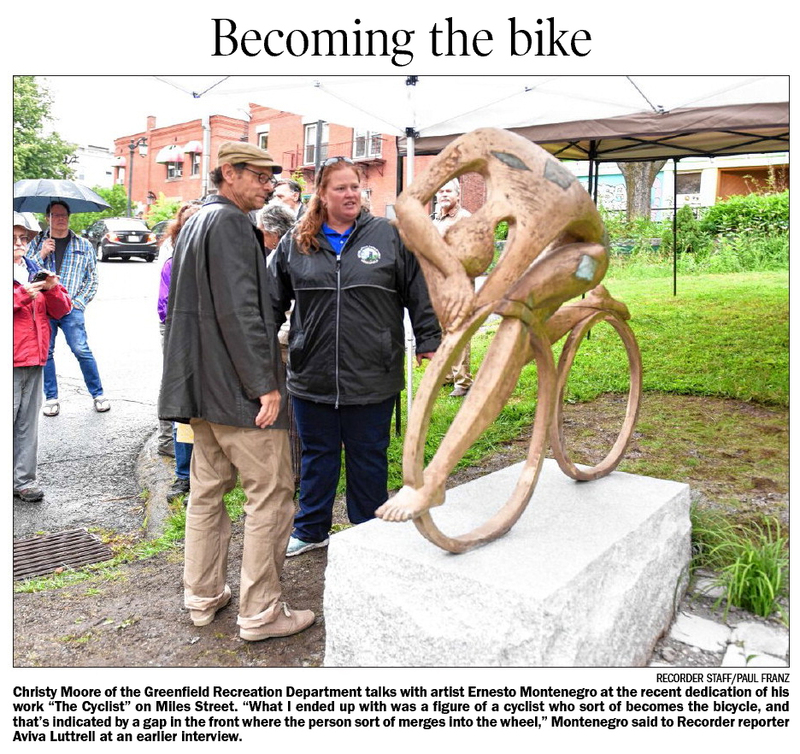 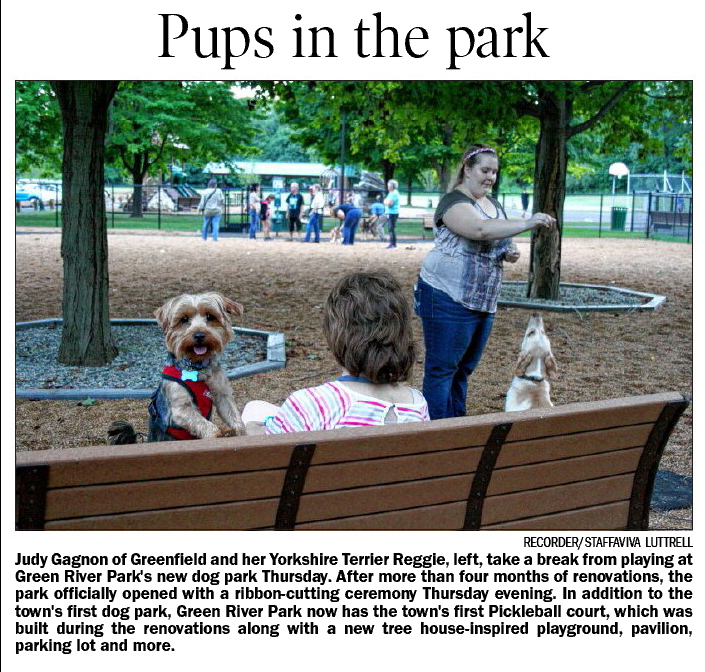 More programs, more park upgrades, more exciting events, and more of making Greenfield a great place to call home. 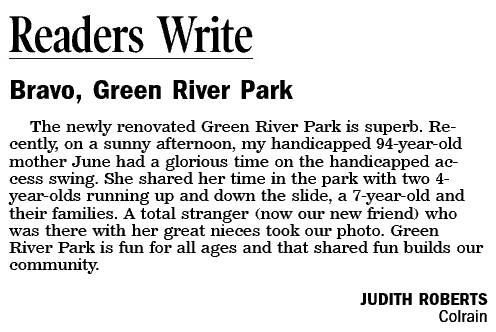 We create community through people, parks, and programs. 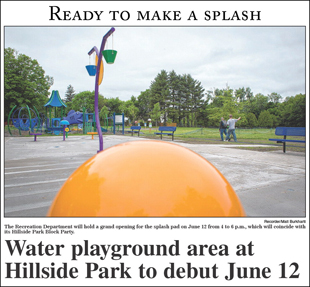 Splash park! 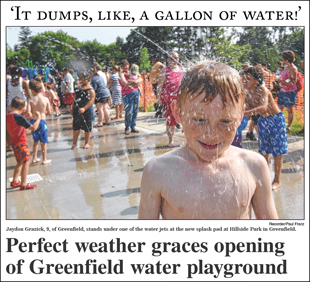 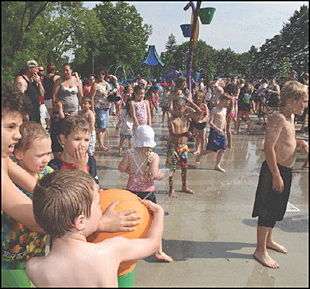 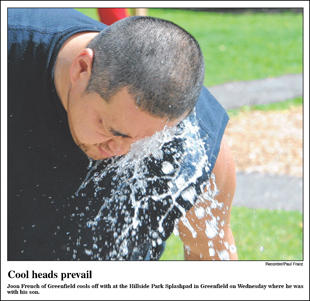 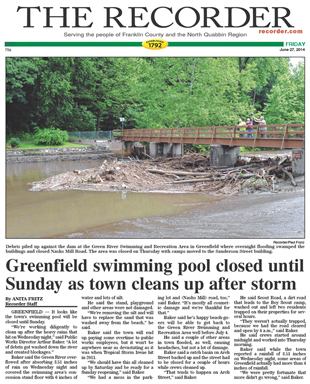 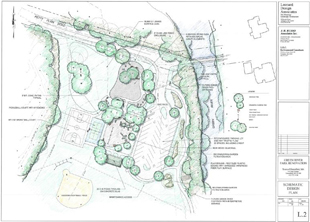 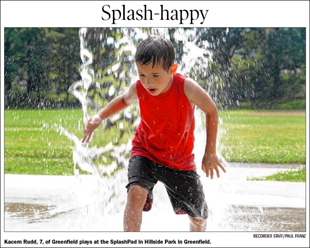 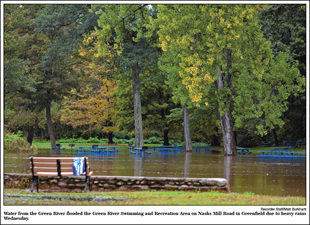 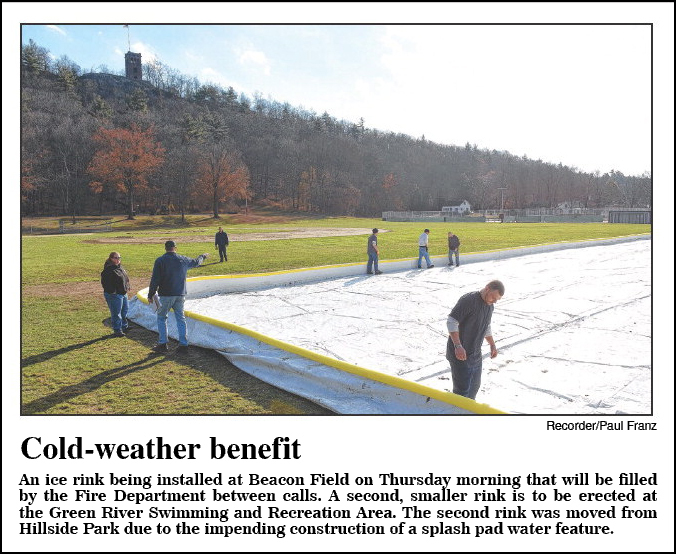 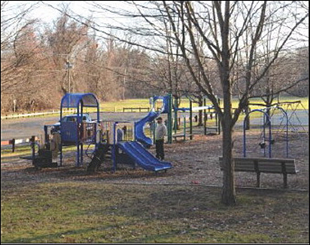 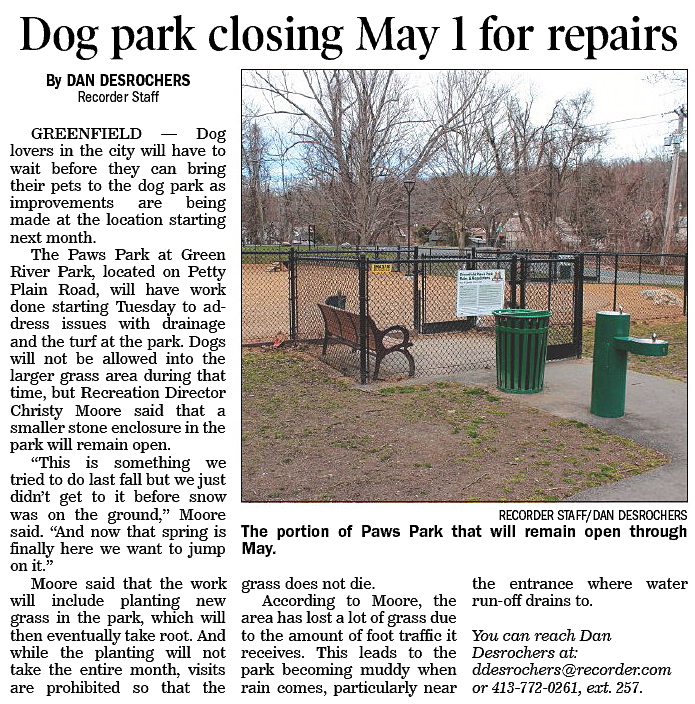 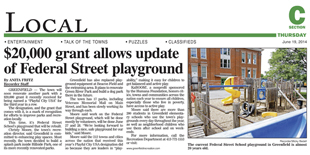 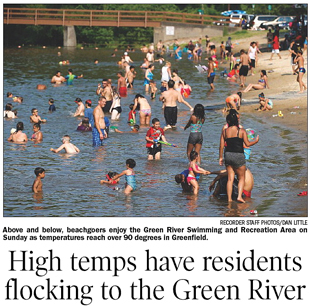 Greenfield secures $200,000 grant, needs $50,000 from town to install water playground at Hillside Park! 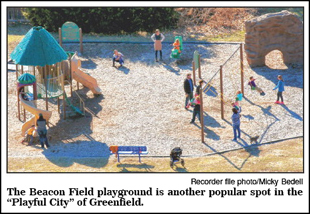 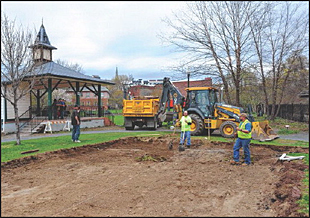 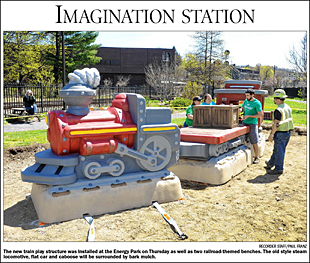 Spring is finally here, and the Greenthumbers are inviting everyone to help get the Greenfield Energy Park ready for summer concerts and events. 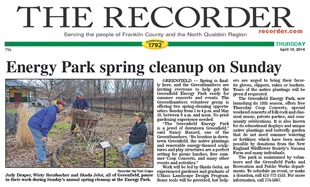 The Greenthumbers volunteer group is offering two spring-cleaning opportunities: Sunday April 13, from 1 to 4 p.m. and May 10, between 9 a.m. and noon. 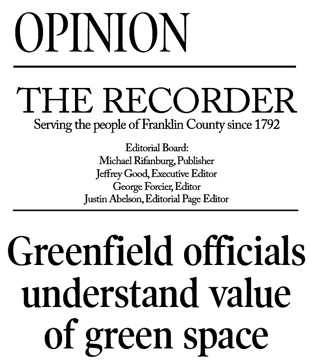 No prior gardening experience needed. 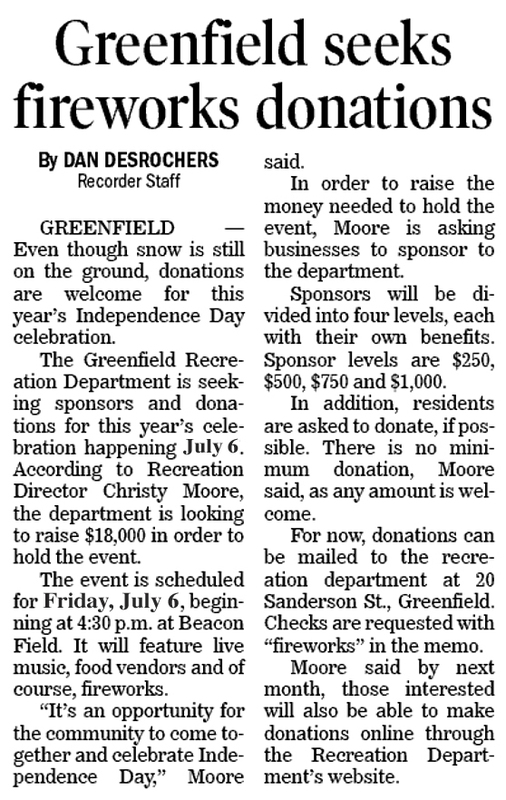 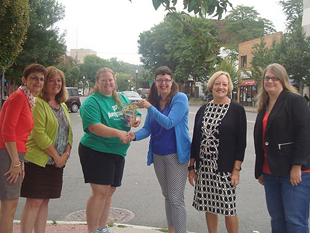 A big thank you to the Greenfield Business Association for their Summer Sidewalk Sales donation to the Recreation Department! 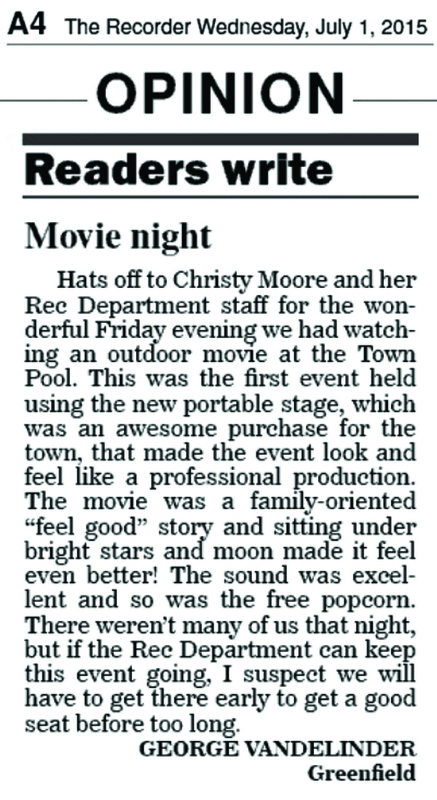 We appreciate your support and collaboration for downtown events!